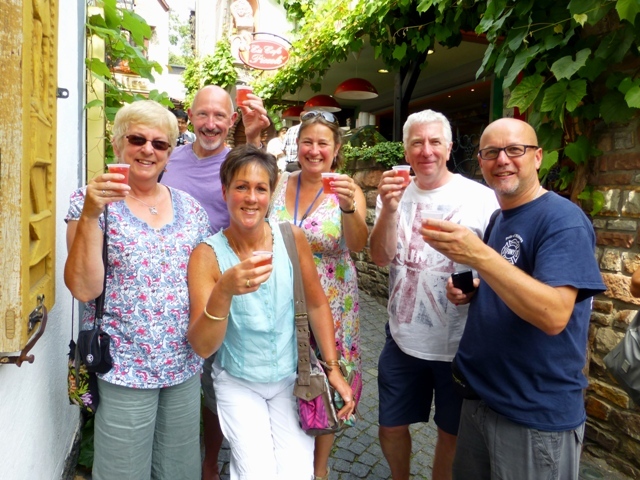 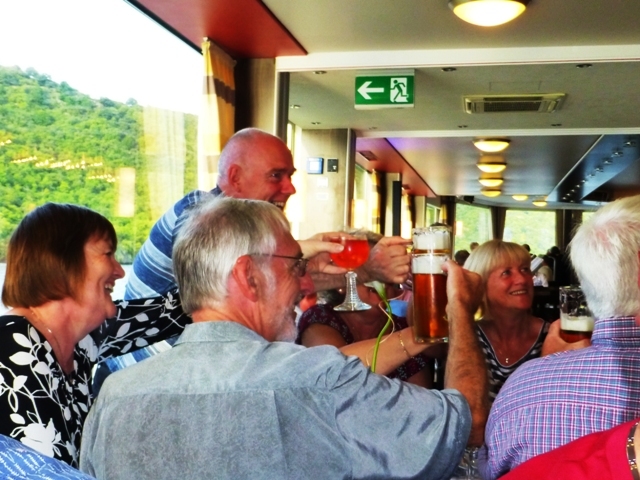 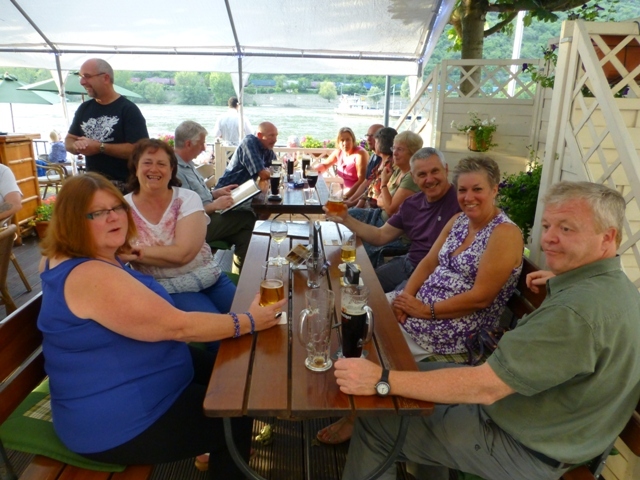 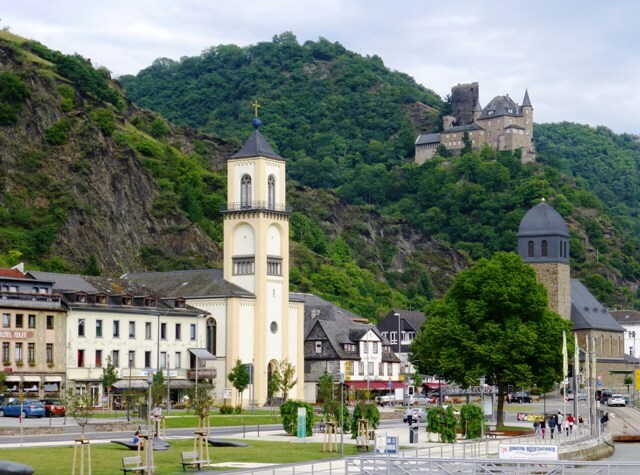 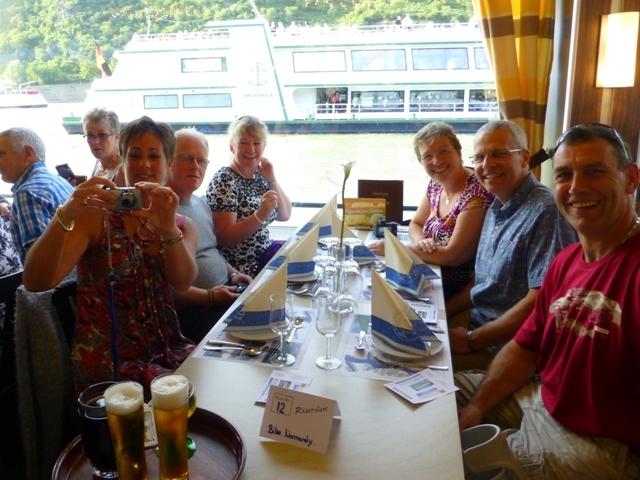 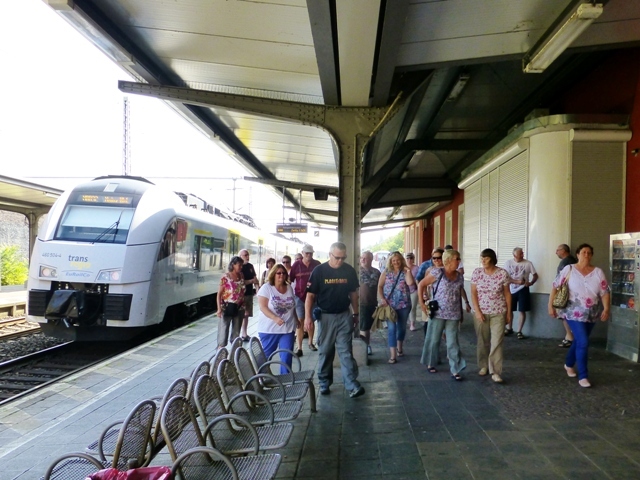 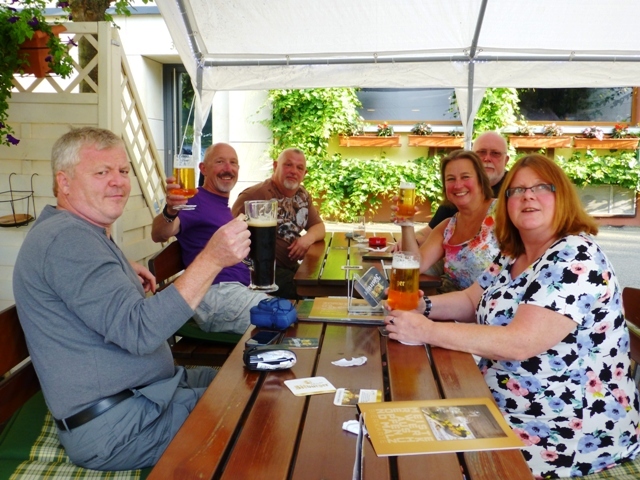 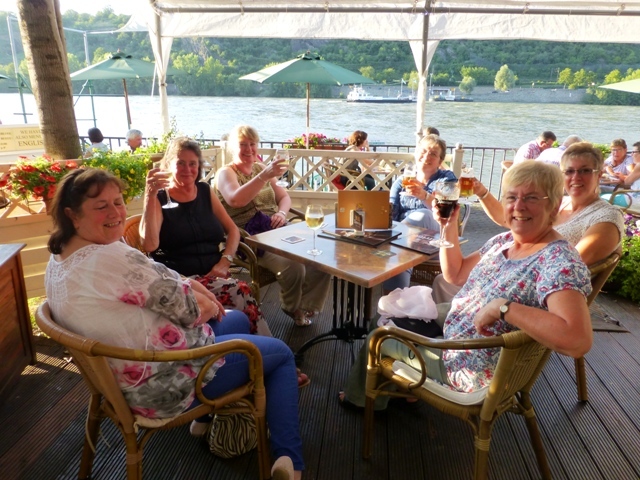 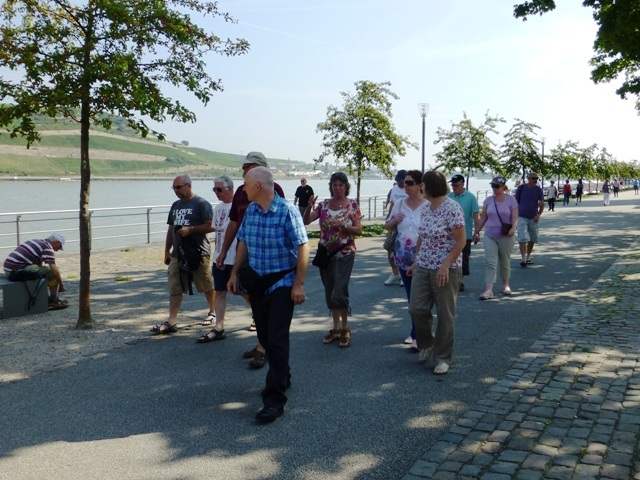 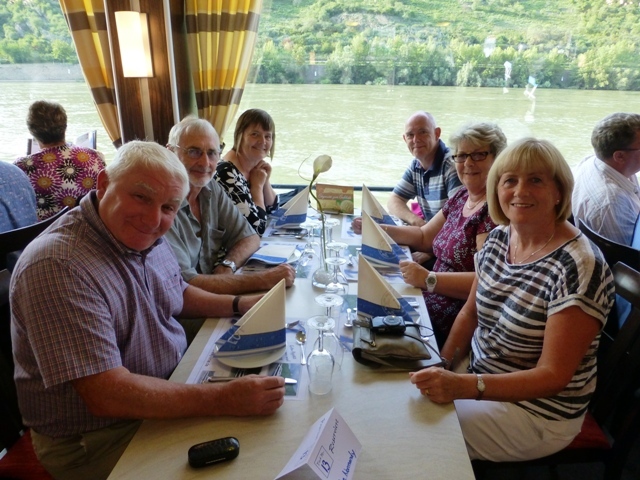 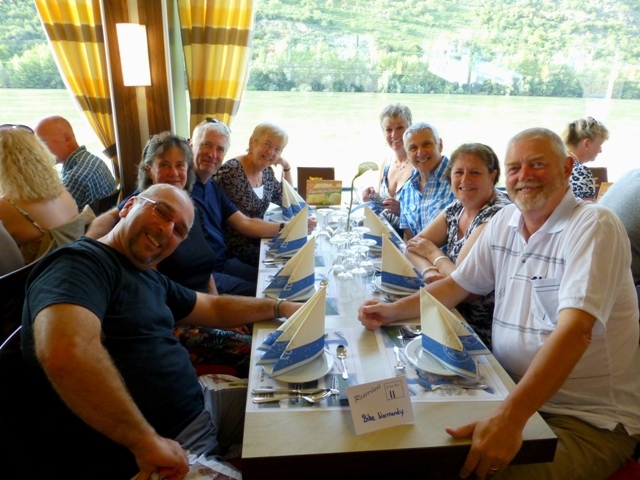 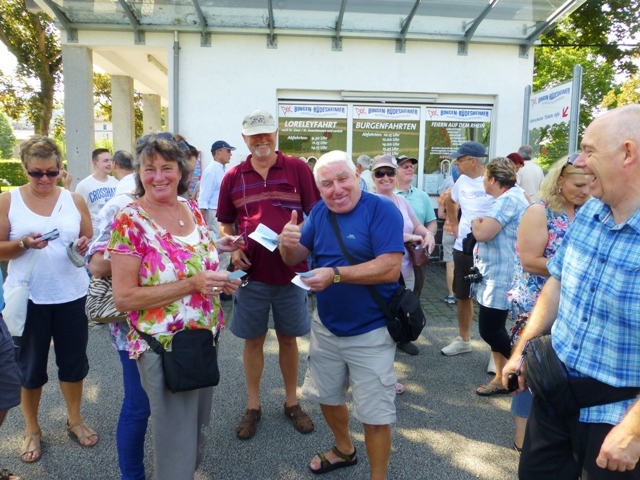 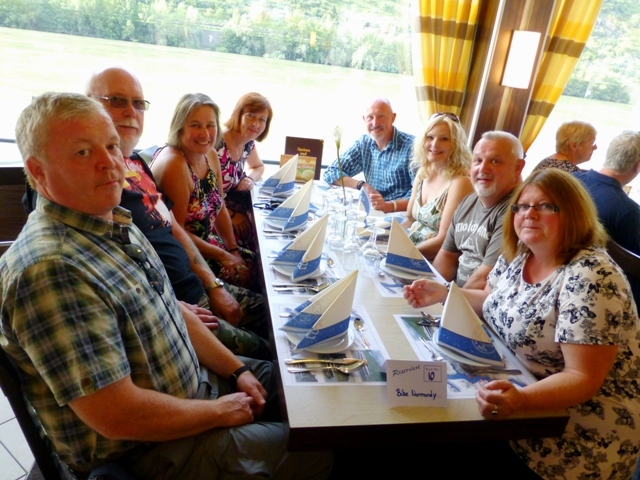 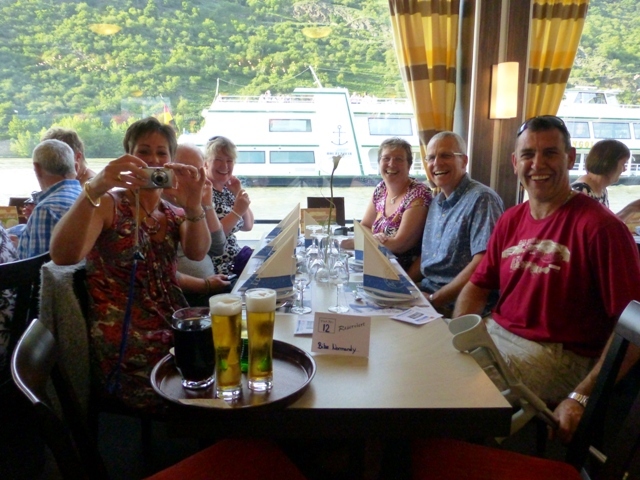 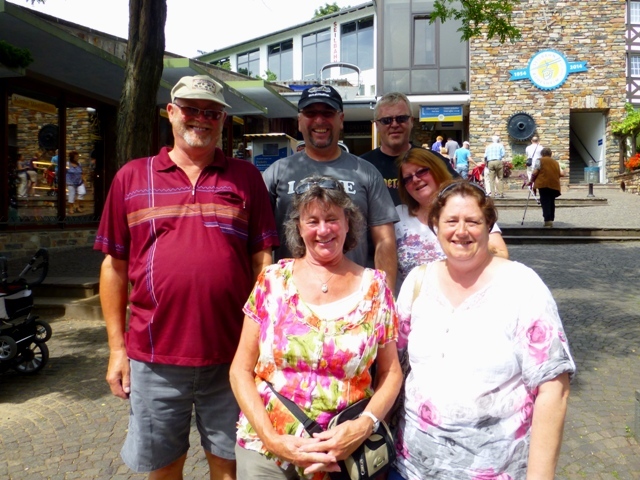 The group ready to leave Boppard – a really great bunch of guests made for a fantastic tour – and no apologies for the number of photos which follow! 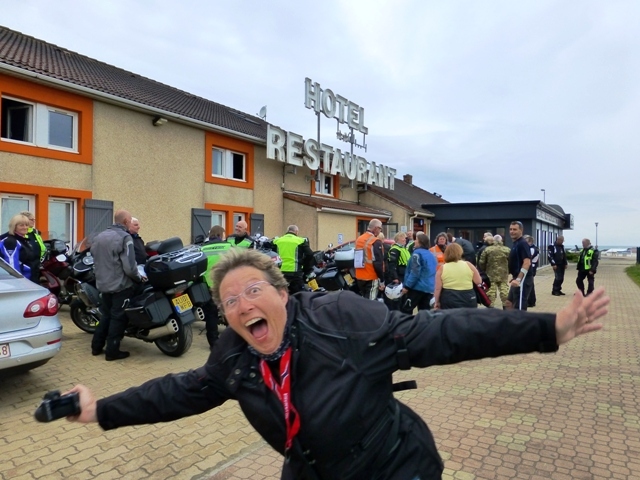 Sue “photo-bombs” the shot of the pre-tour briefing! 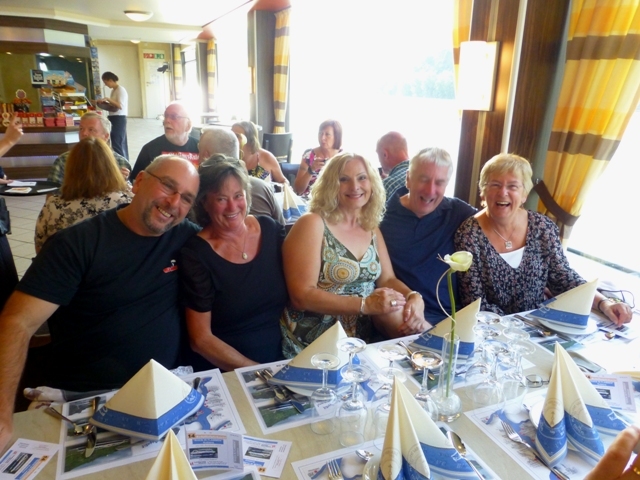 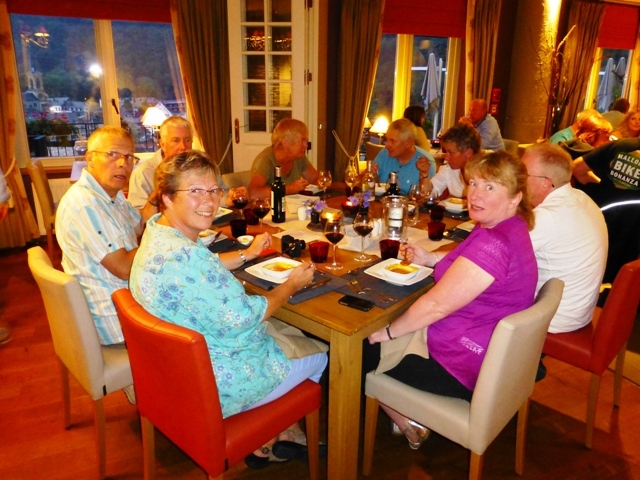 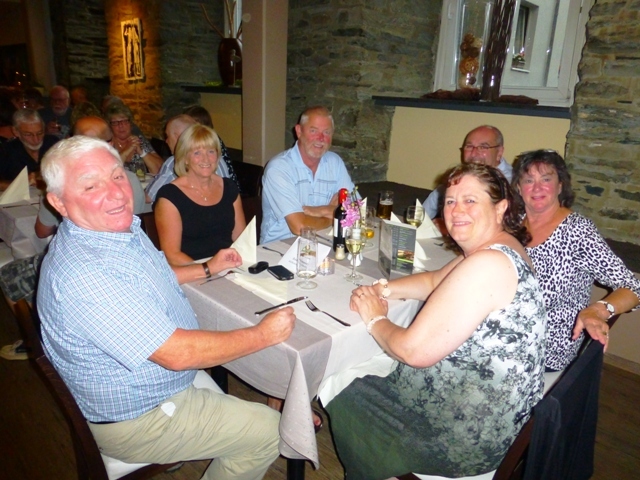 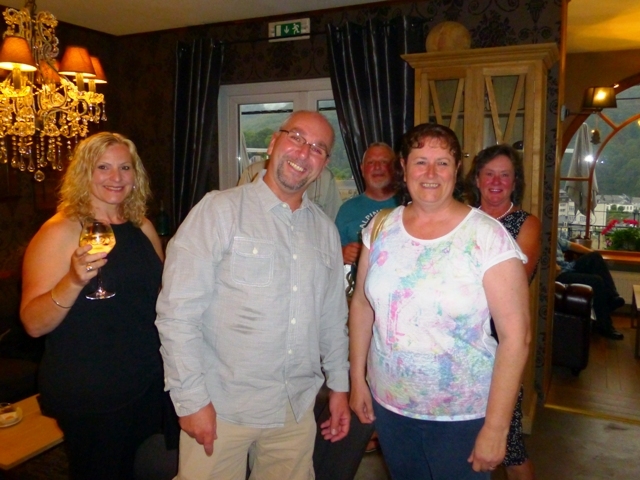 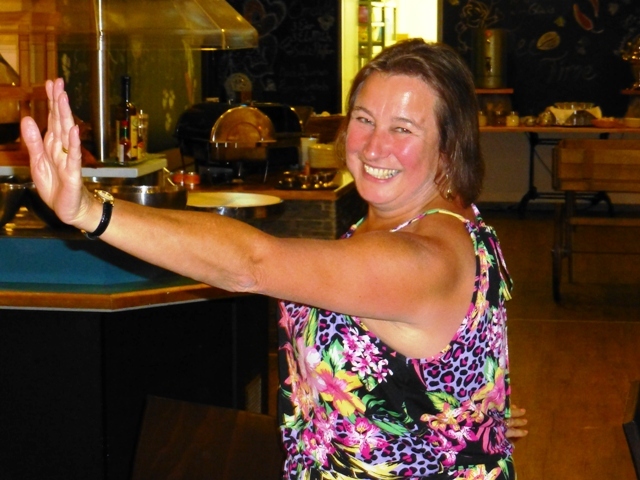 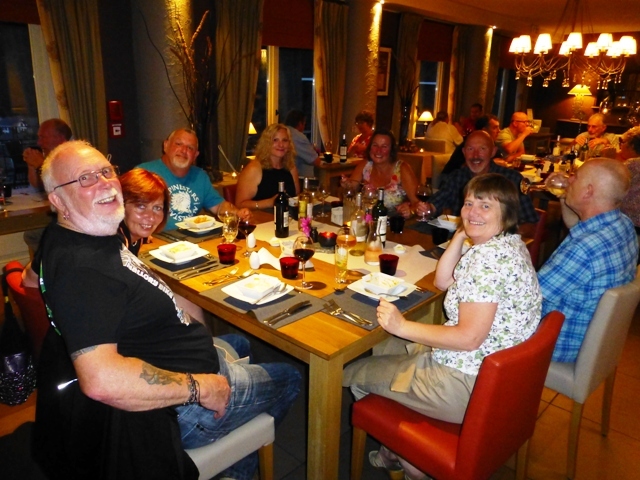 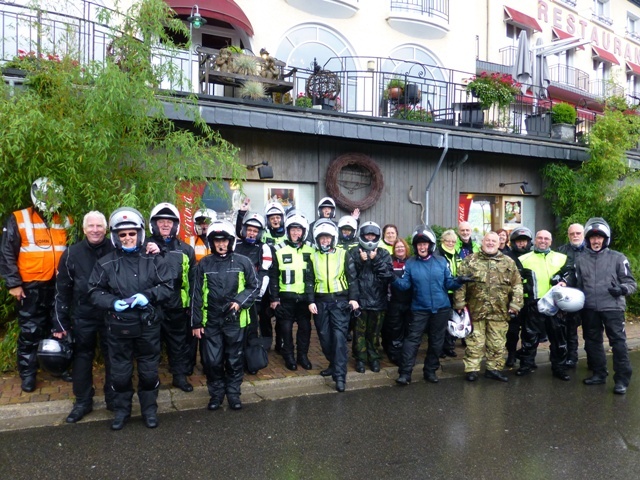 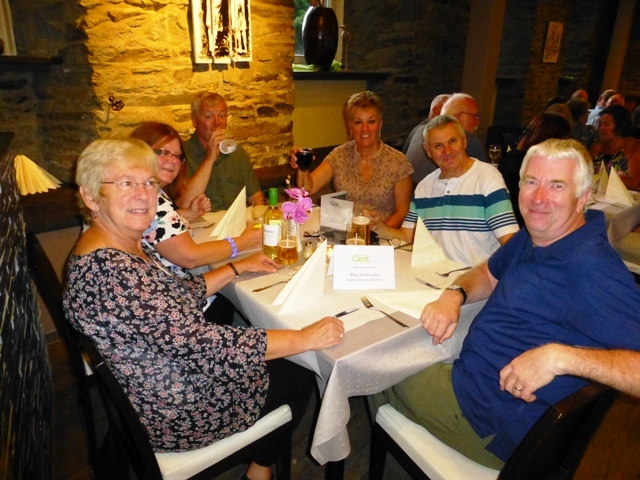 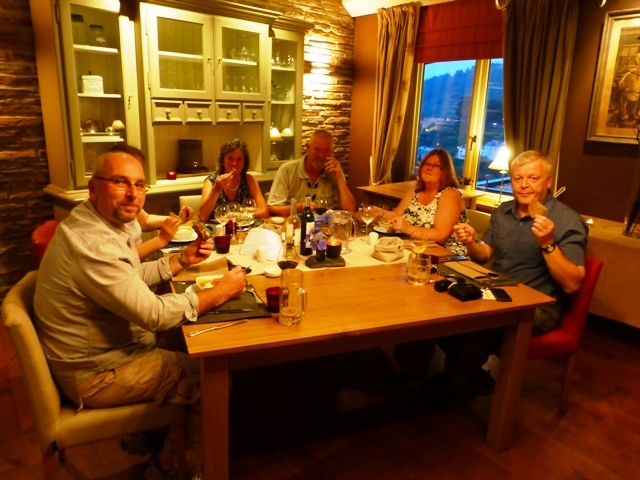 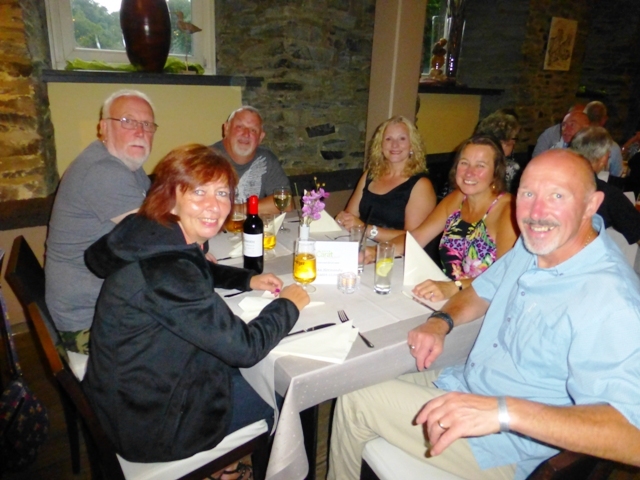 After a day of relentless rain, when unfortunately Jane Bishop had an accident and was taken to hospital, the group (minus Steve Poole her partner and Ken & Sue Wright) arrive at our hotel – soaked to the skin but still in good spirits! 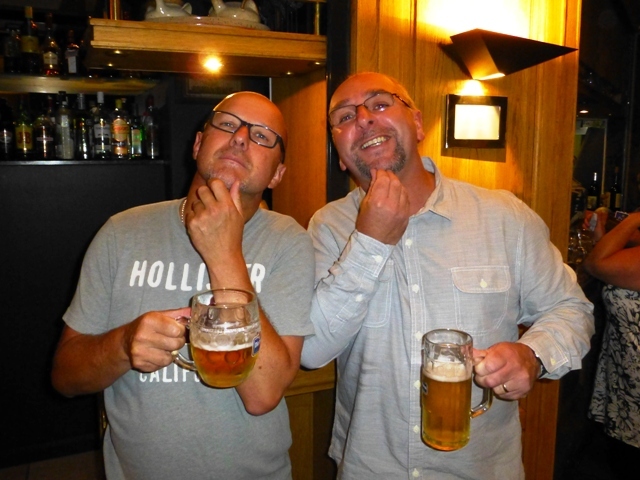 Tim Hale (our van driver on this tour) with Barry – could they be brothers? 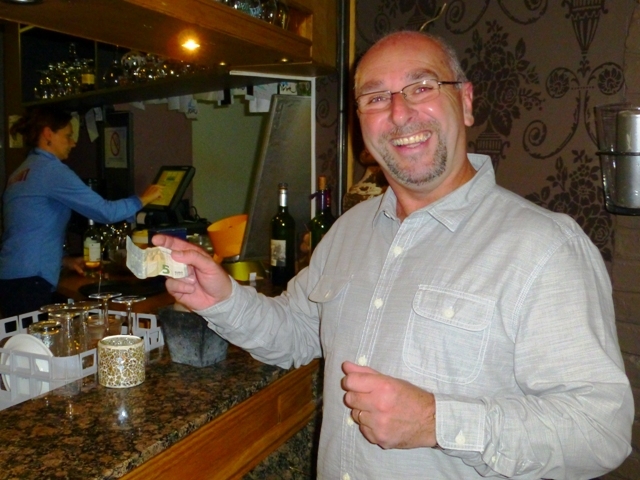 Barry caught parting with cash – then we discover it wasn’t even his !! 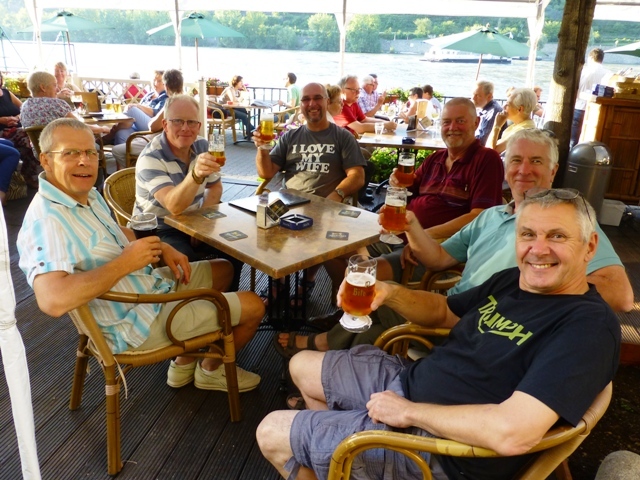 “Another tour to leave us with life long memories of laughter, good riding (pain free knees for Fran for the first time ever), friendship and amazing experiences. 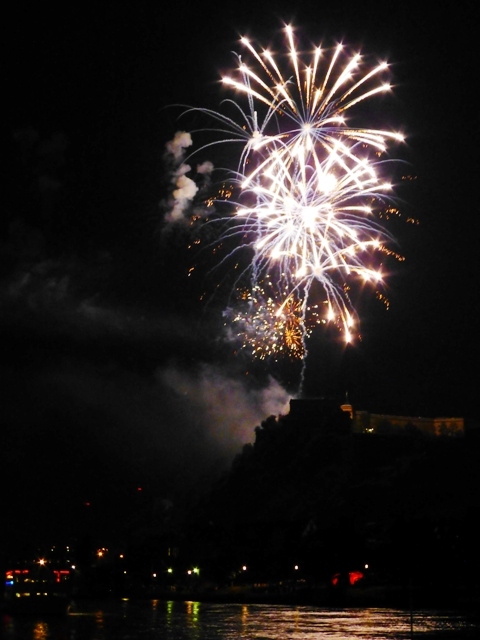 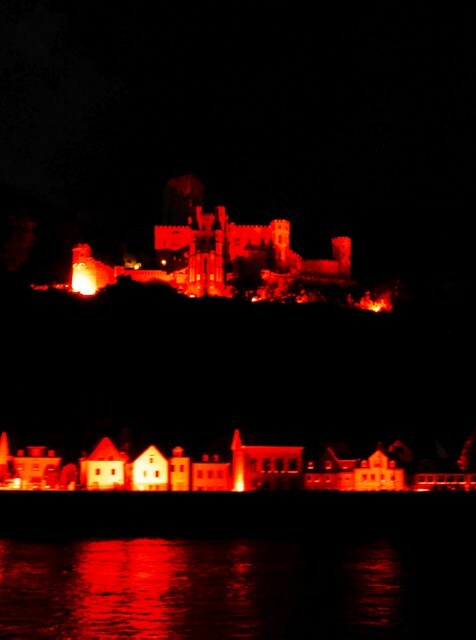 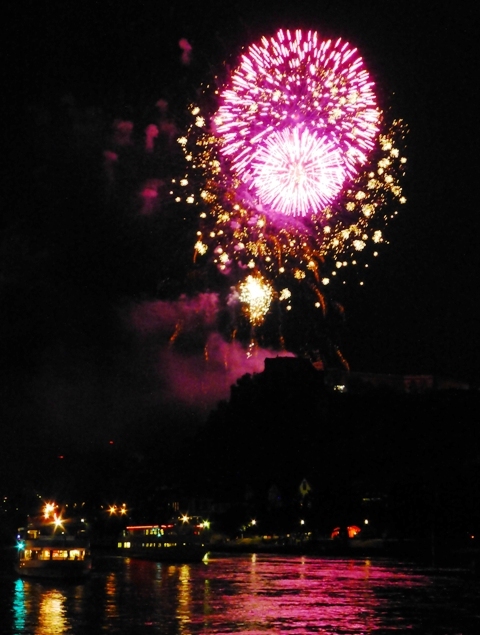 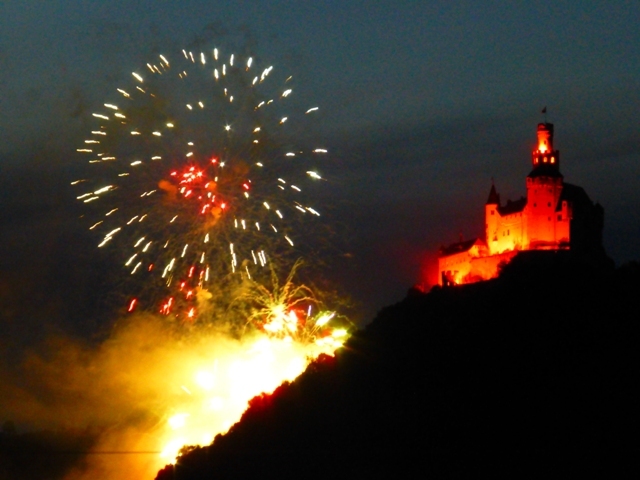 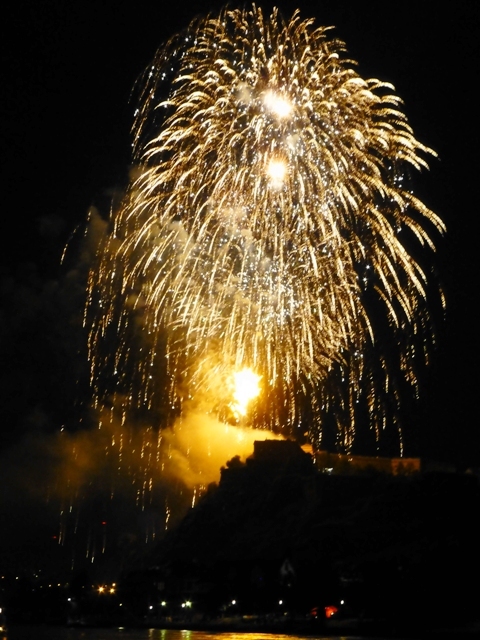 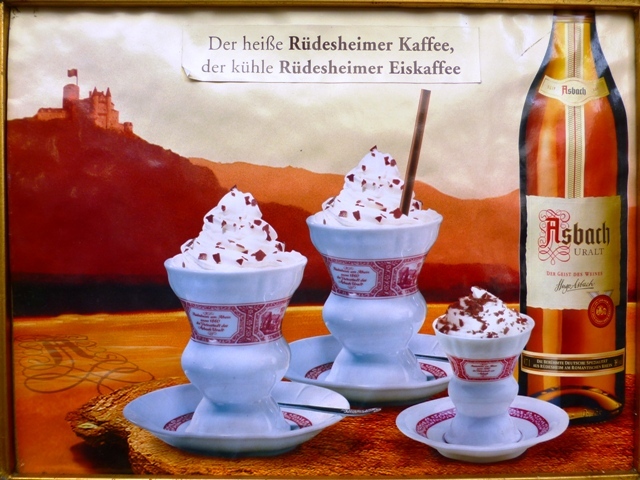 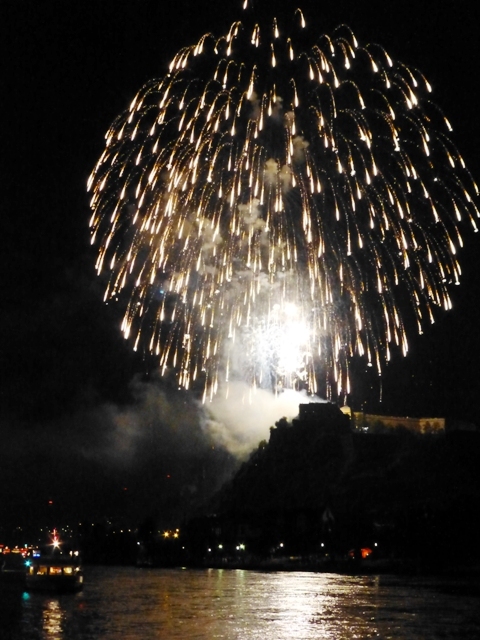 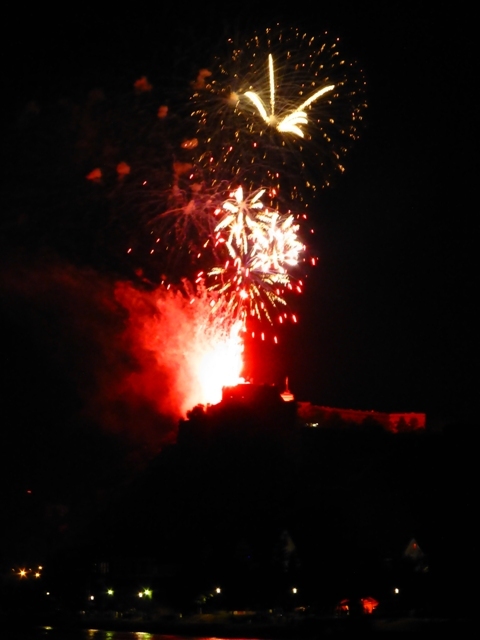 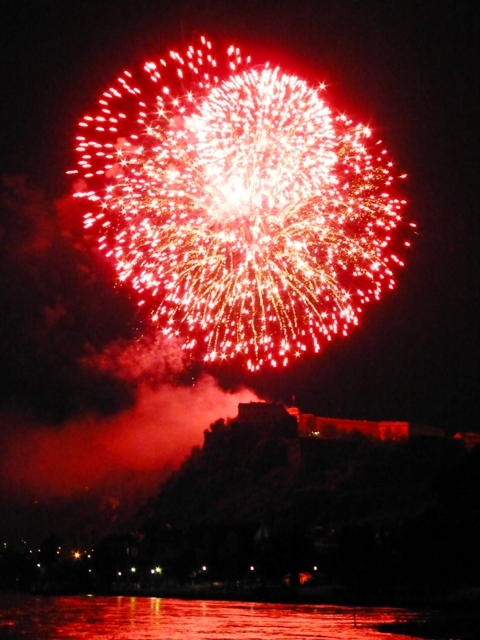 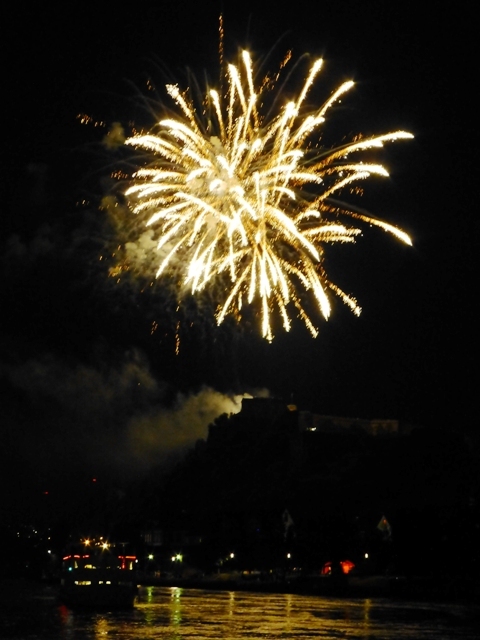 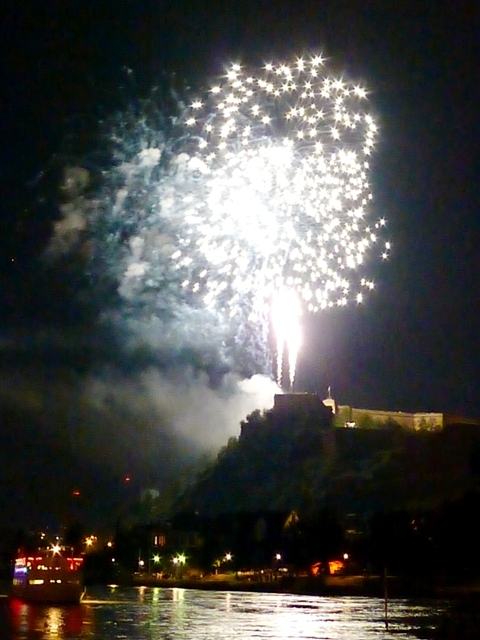 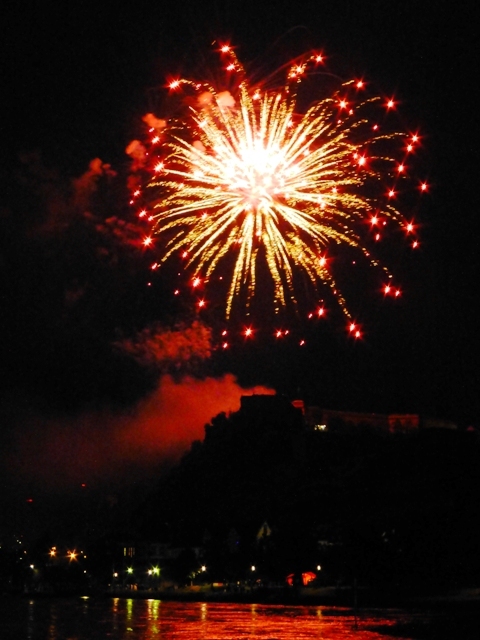 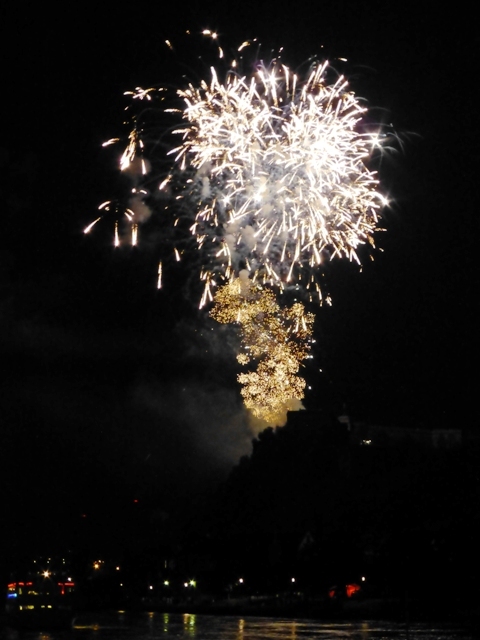 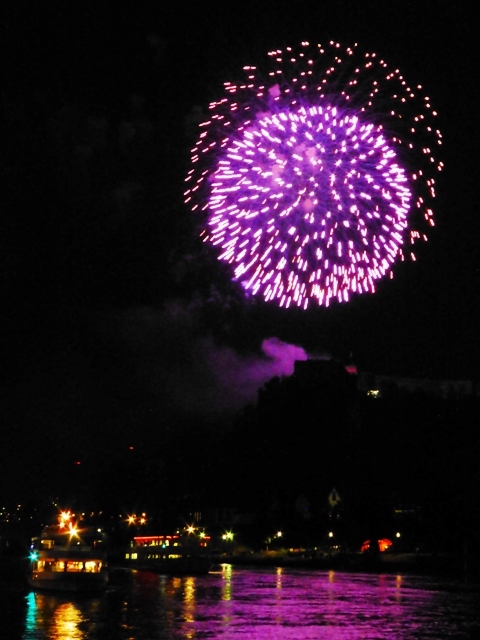 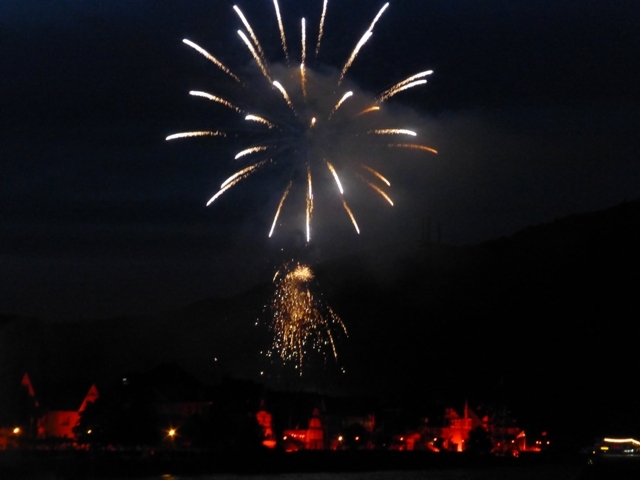 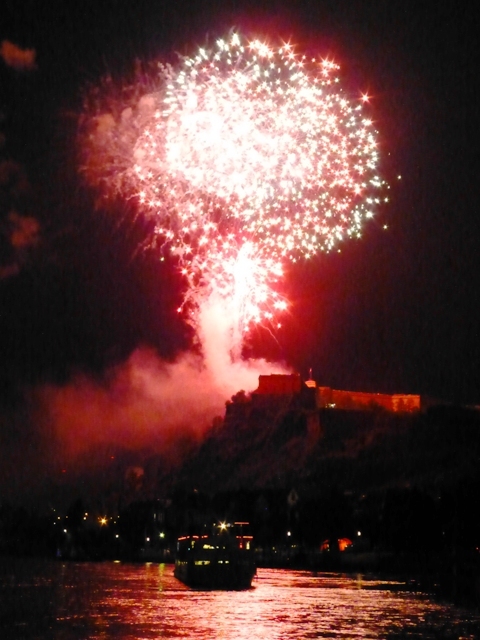 We couldn’t have conceived how lovely it would be to see the Rhine in Flames. 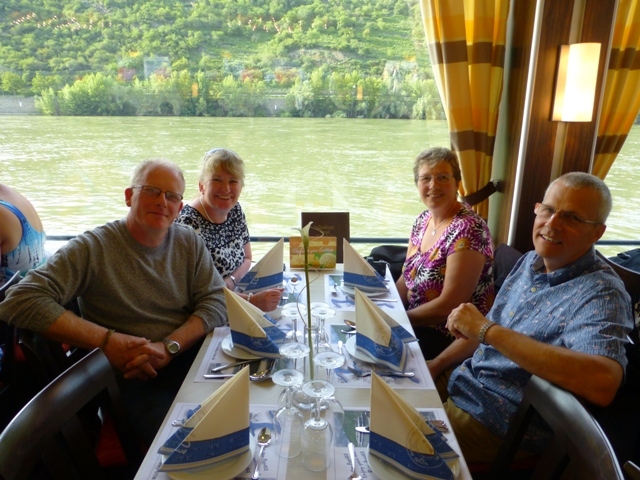 The braziers along the rivers banks, the red lit houses, churches and castles, the wonderful fireworks as we travelled on the water towards Koblenz, and the awe inspiring finale over the castle there, all made for a memorable evening – and that`s without the meal, wine, music and dancing – thanks Bike Normandy for such a stonking good time! 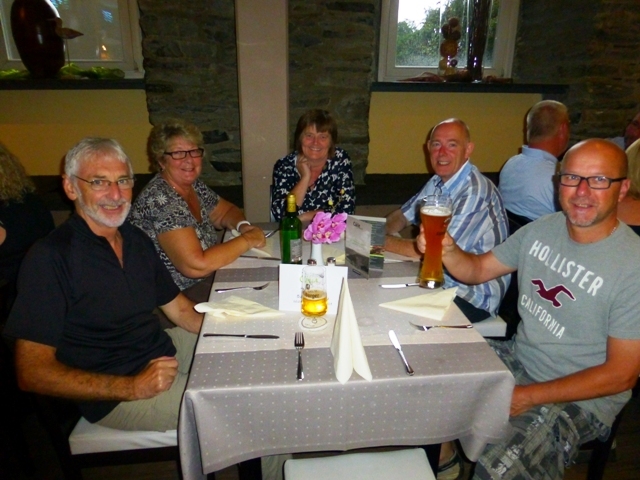 From beginning to end we always feel at home with John and Jen, and dear Rita and John (such quick wit!) 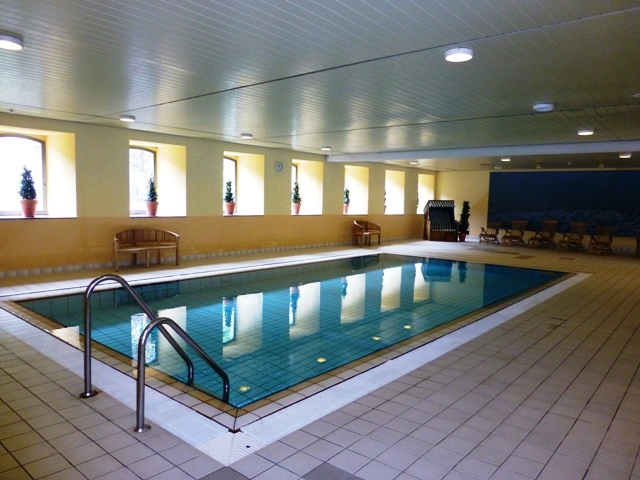 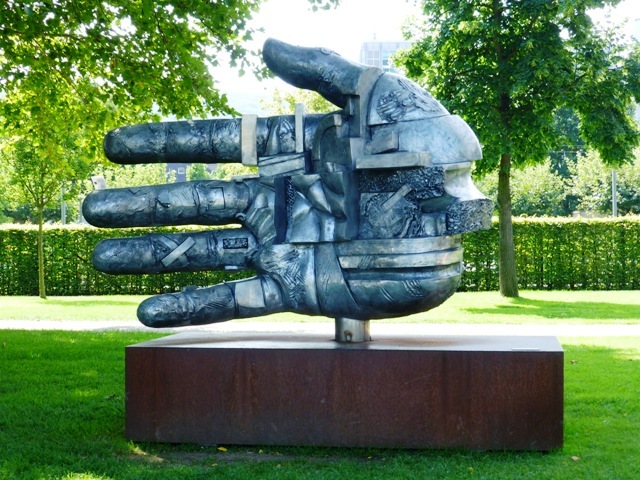 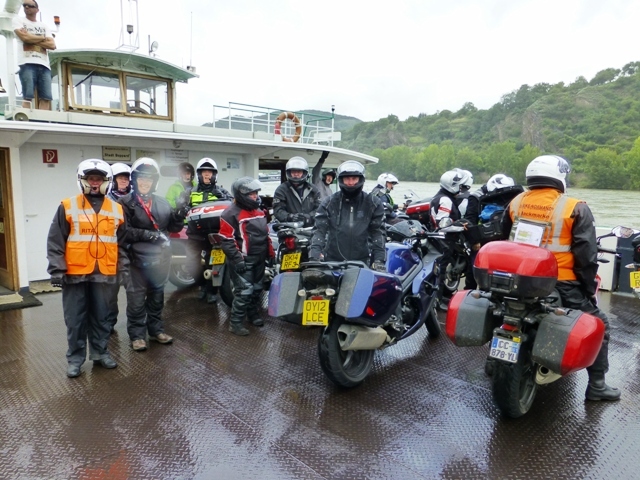 The sad start was so well managed and showed again to us all the thorough planning and care that is taken in preparation for everything that happens. 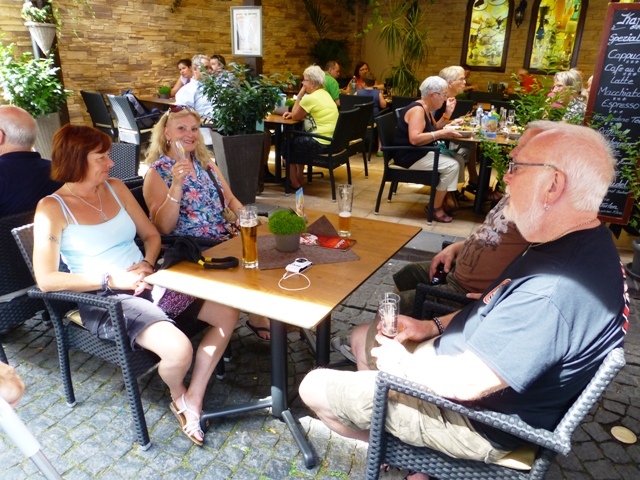 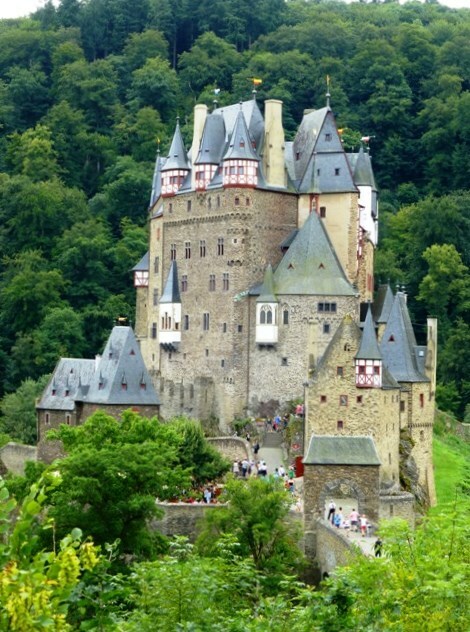 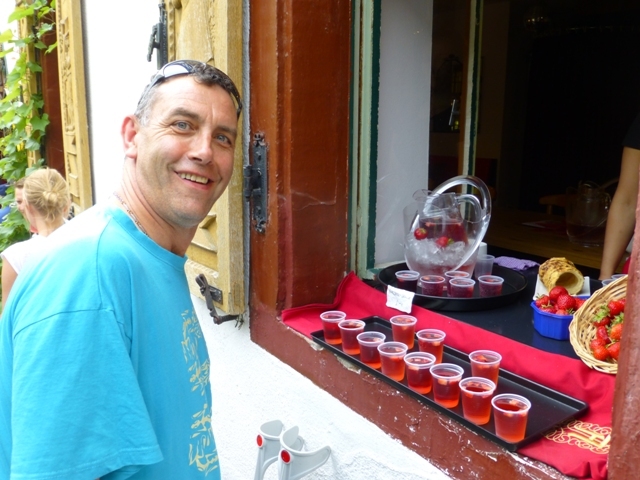 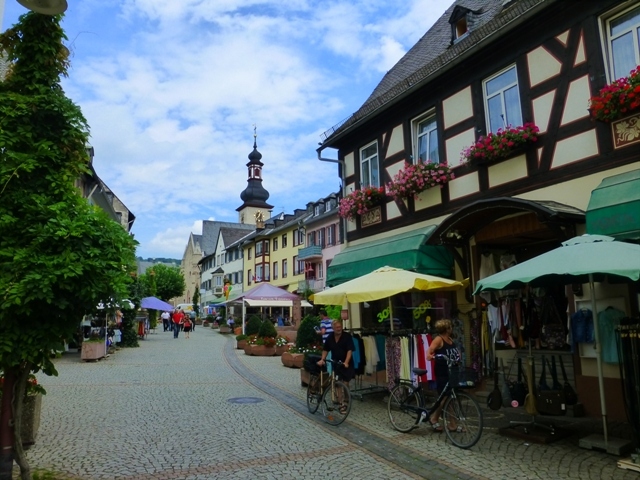 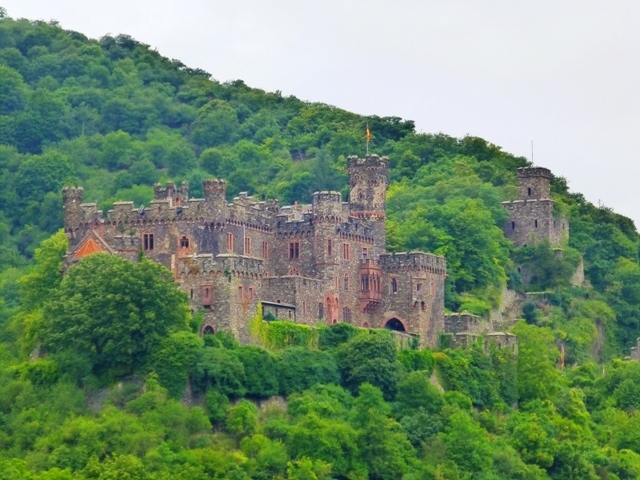 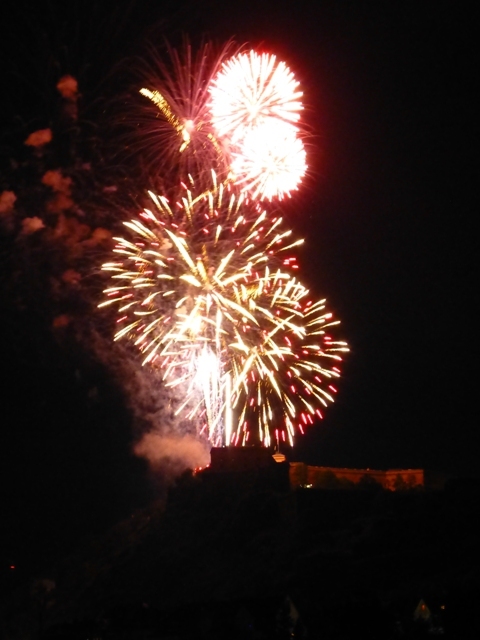 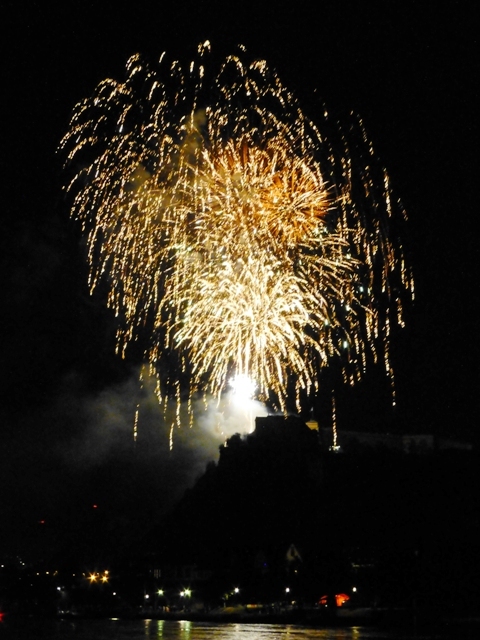 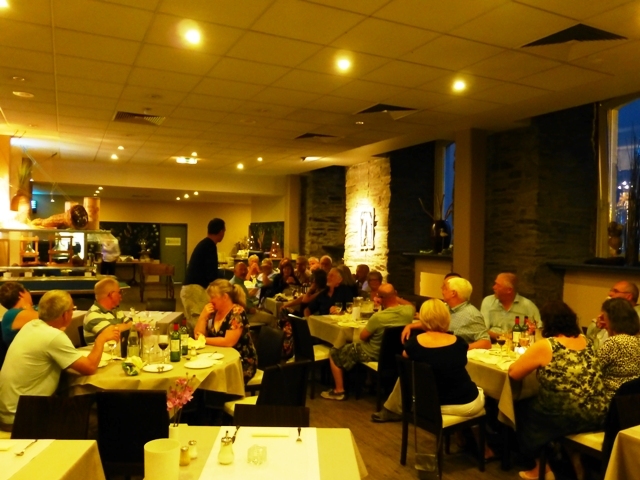 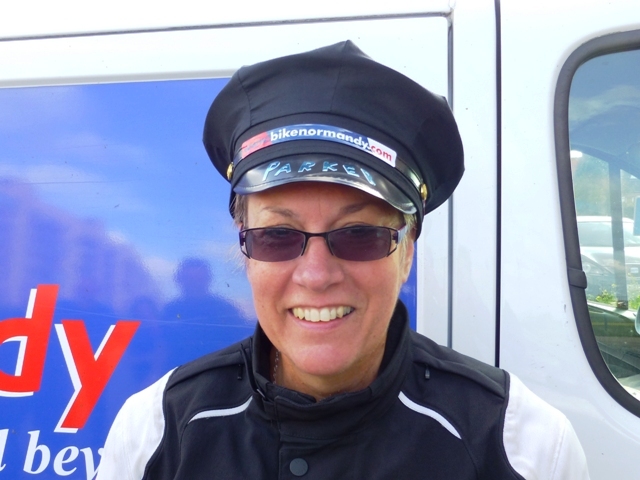 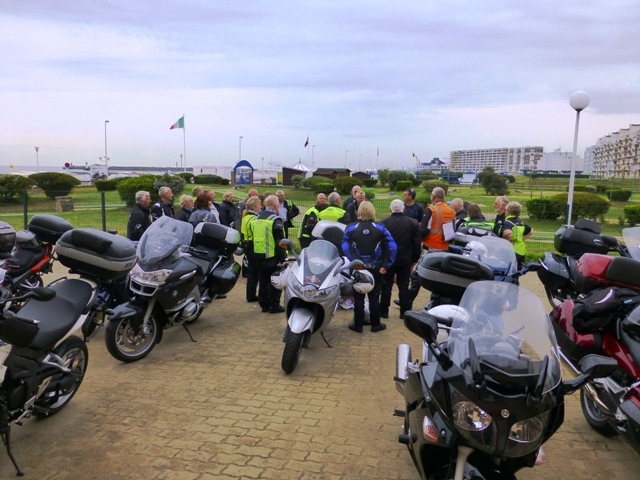 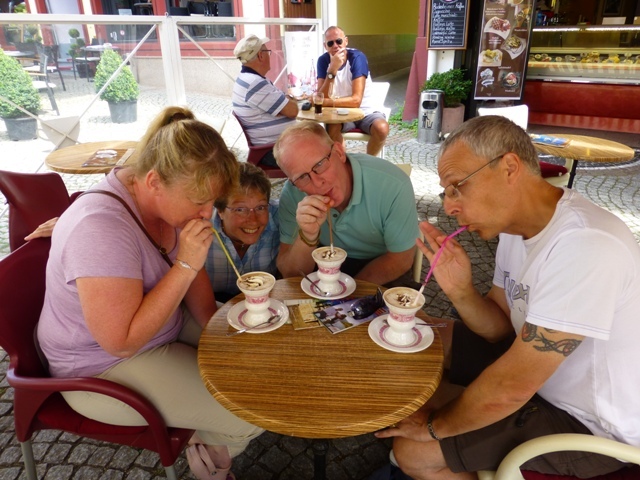 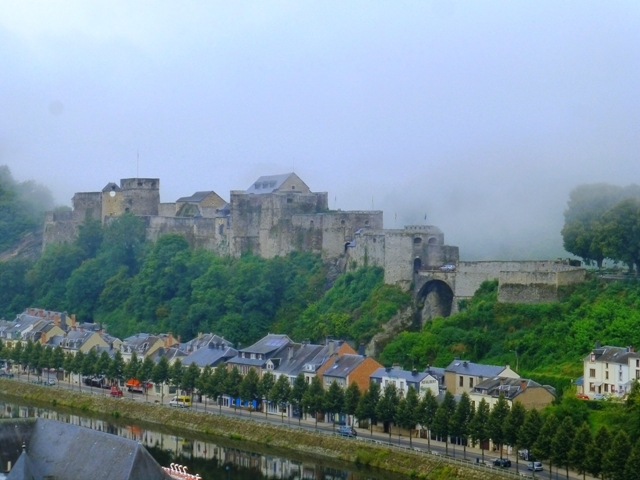 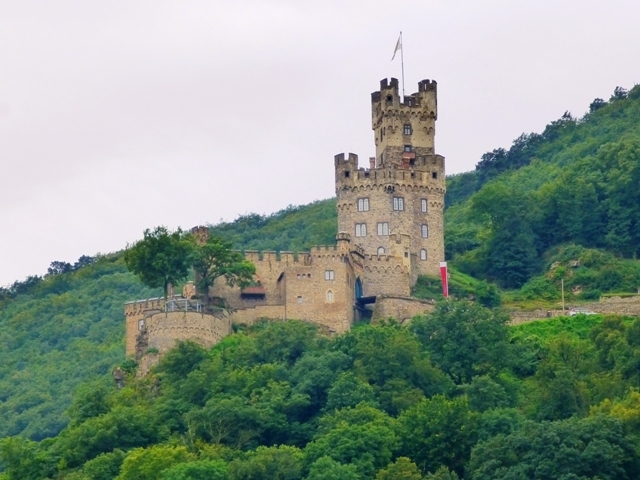 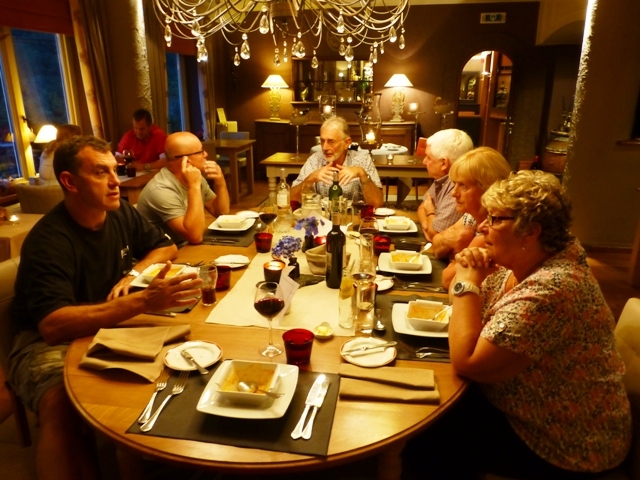 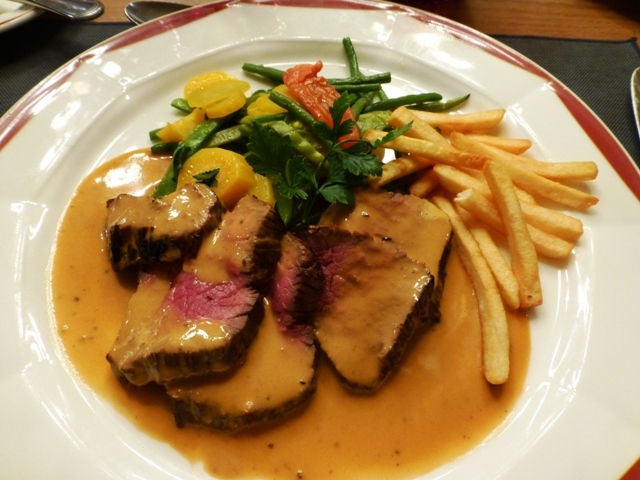 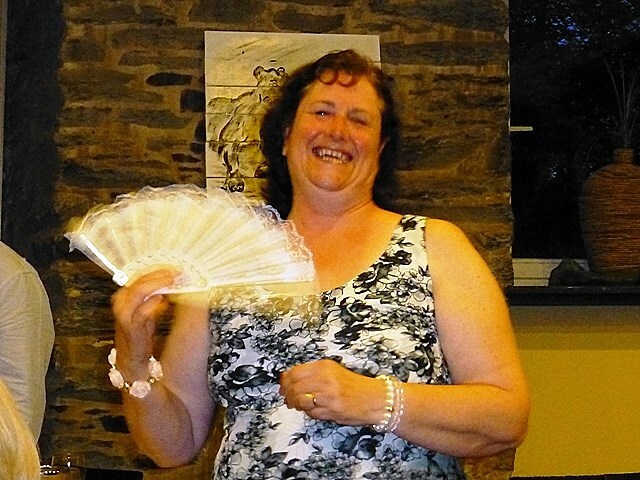 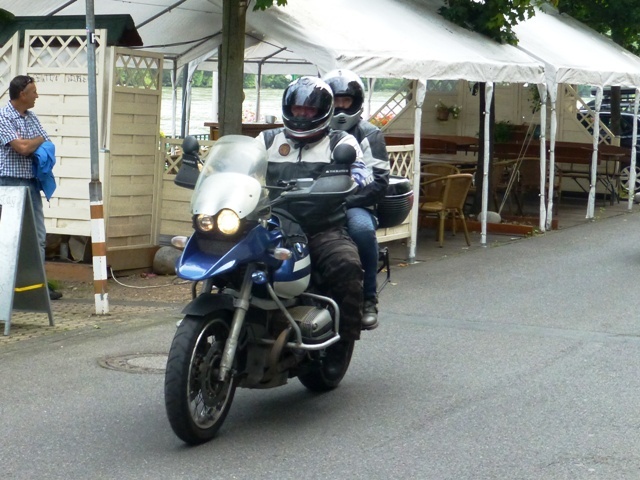 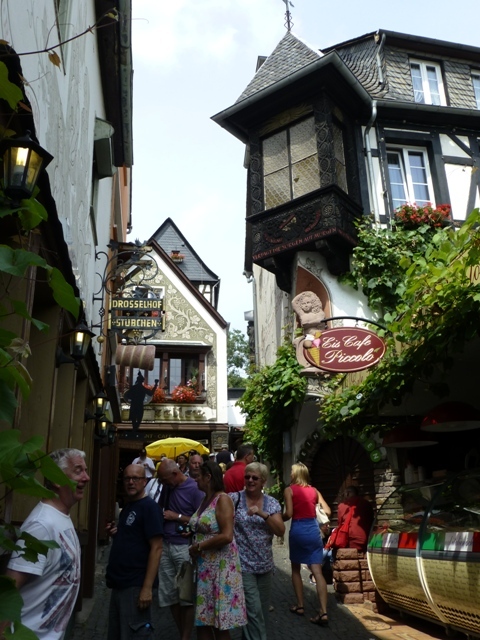 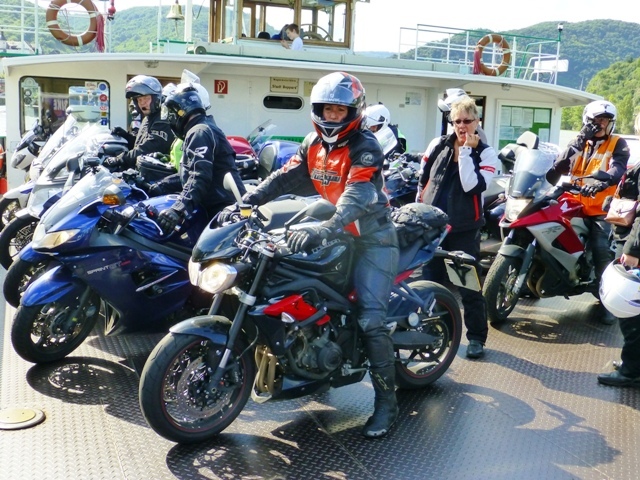 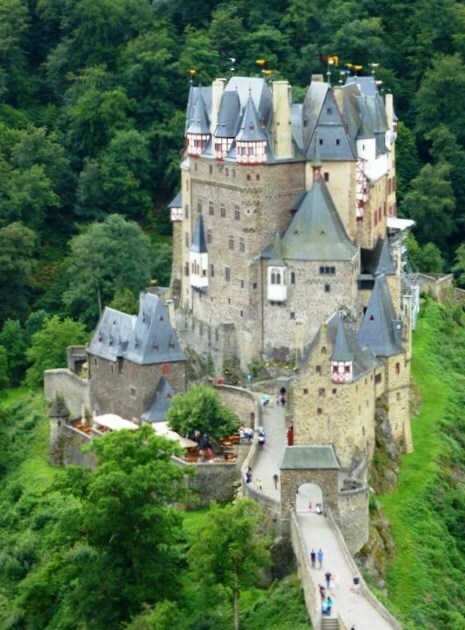 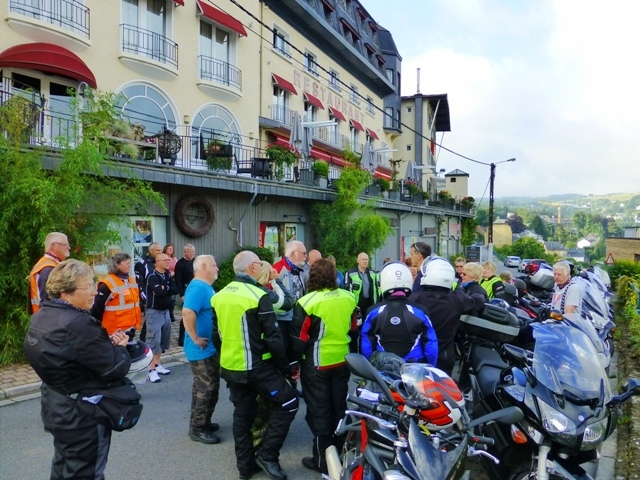 We really appreciated the selection of castle visits, the wonderful accommodation, the well timed coffee and lunch stops and, on this tour, Jen`s immaculate riding on such varied roads, which always got us all where we needed to be. 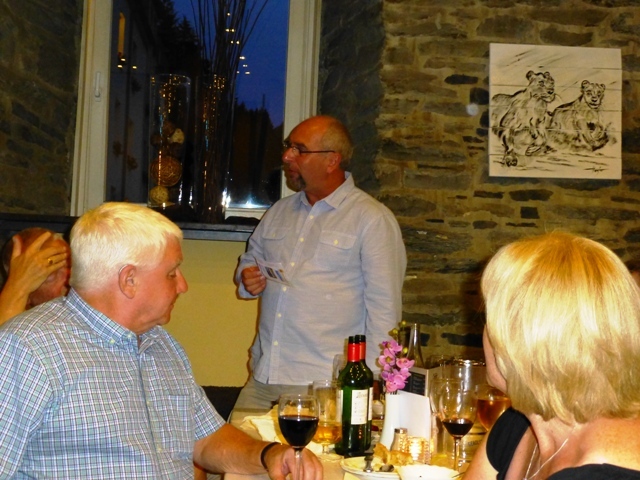 Johns talks and guidance greatly appreciated, as always, and we wish him well as he returns to full health again. 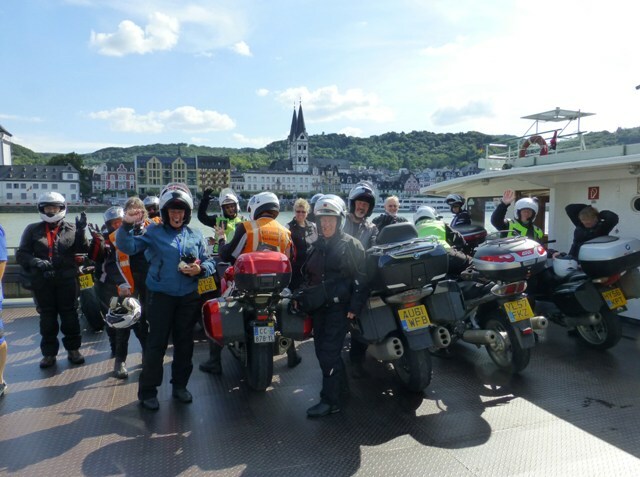 We are once again inspired to get on the website and see what we can do next – race you all, but hope to see lots of you again some time! 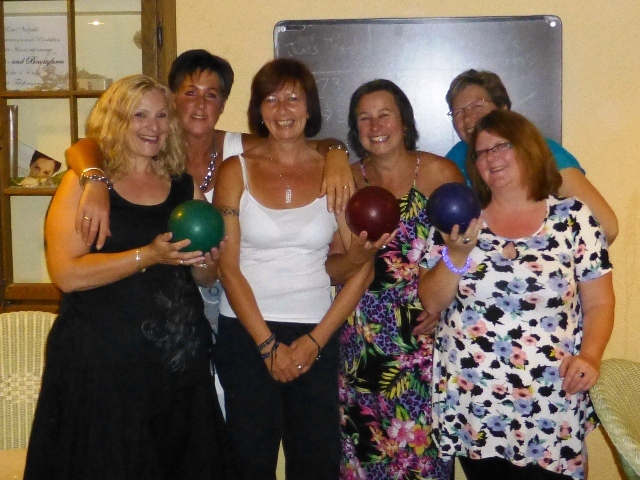 Boys – vs – Girls ! 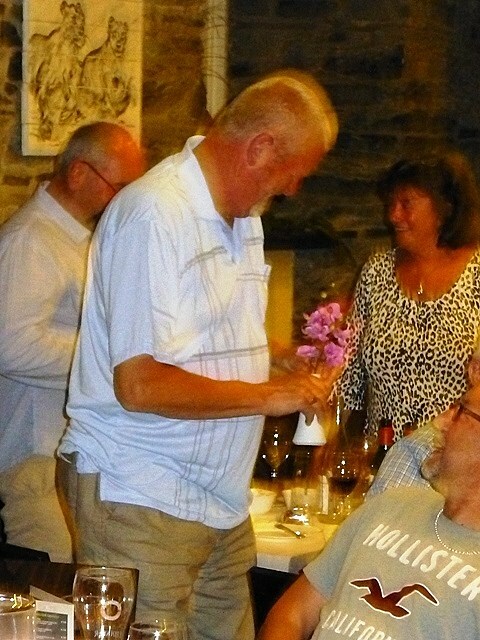 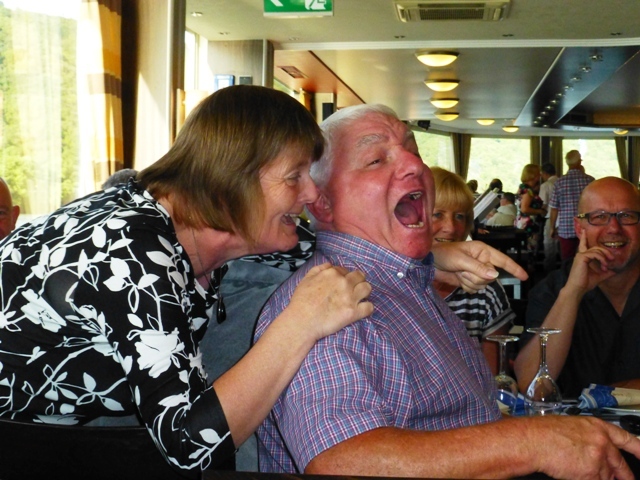 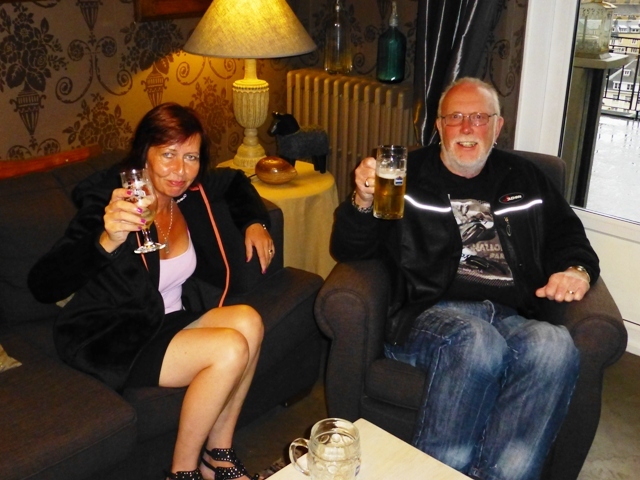 Jean & Sandra on the Rose wine; Barry Loves his Wife – but only because she lets him ride his bike!!! 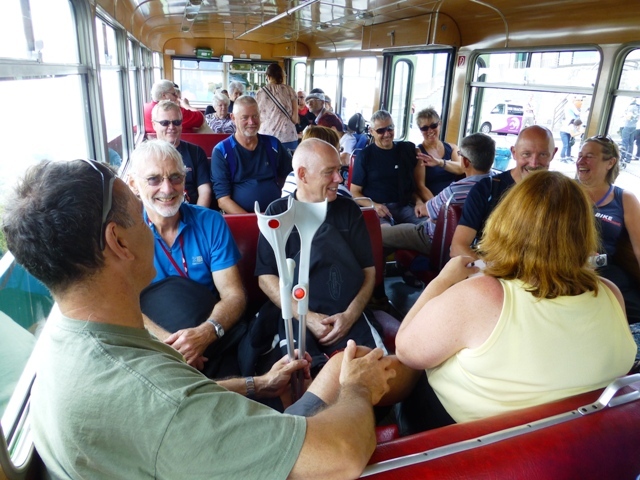 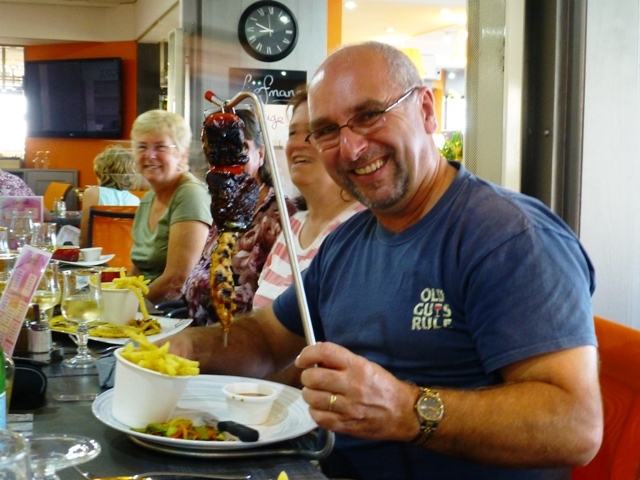 With John still on crutches, Ron is appointed “Deputy Tour Leader in Charge of Ferry Tickets”! 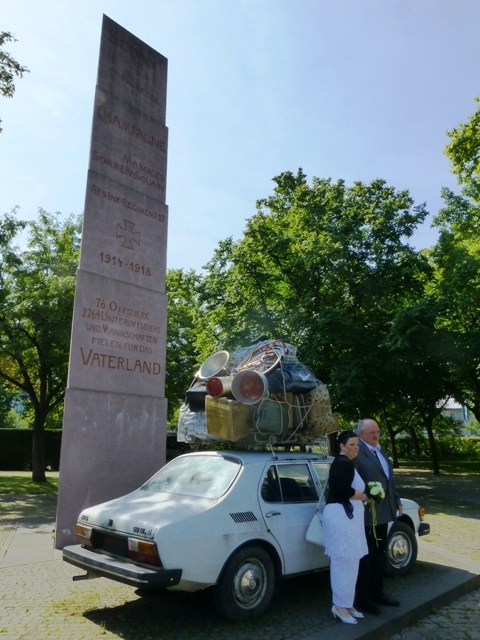 Is this really the wedding limousine ?? 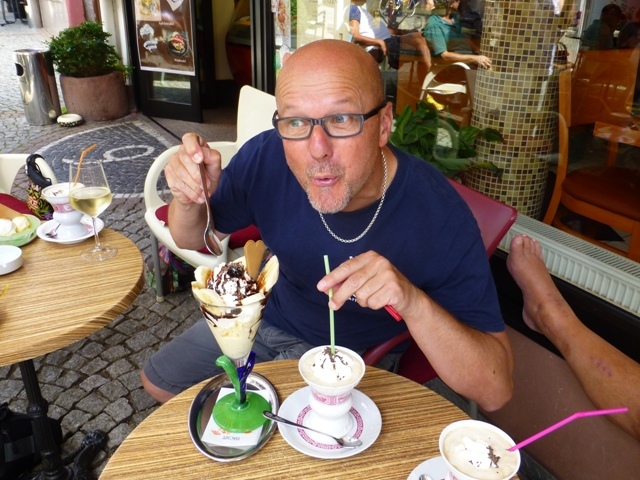 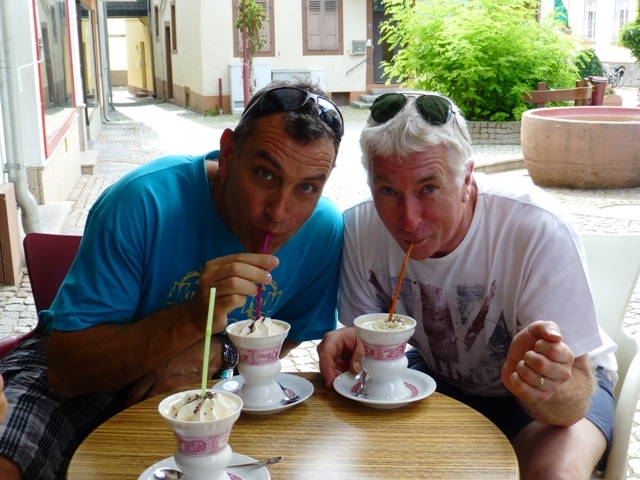 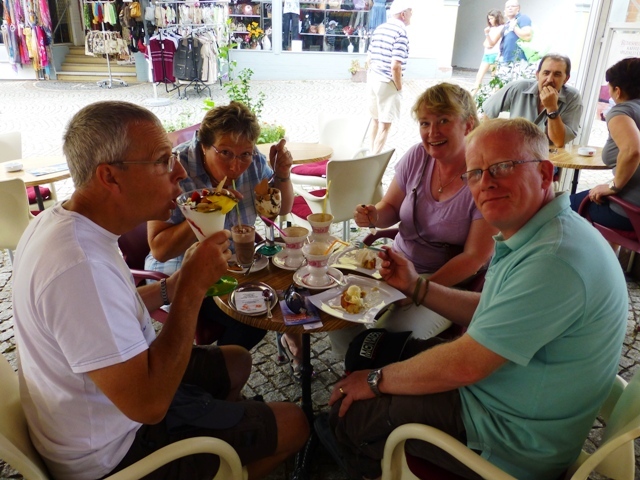 John & Terry; Tim can’t resist having an ice cream as well! 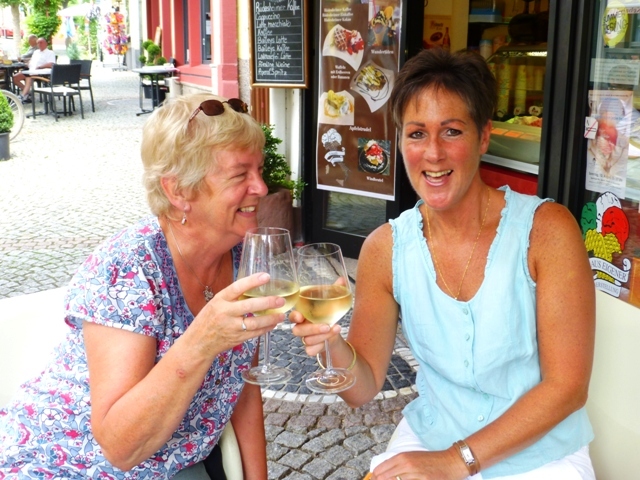 Fran & Jen start with wine! 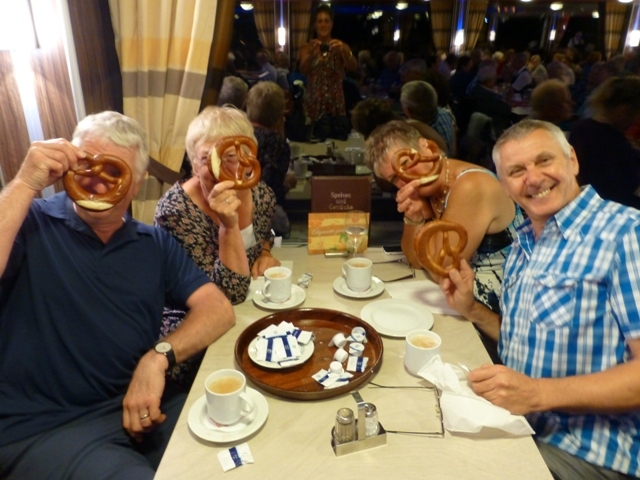 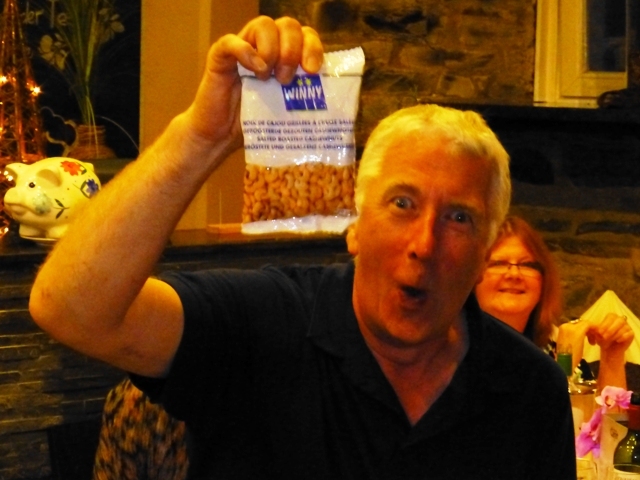 Ken & Sue, Chris & Kath move onto apple strudels! 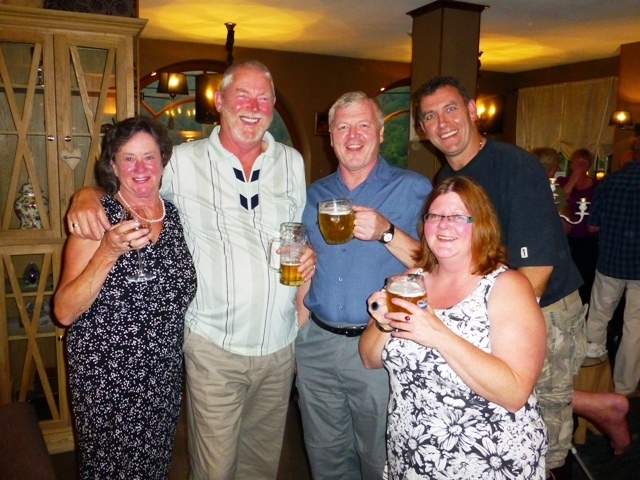 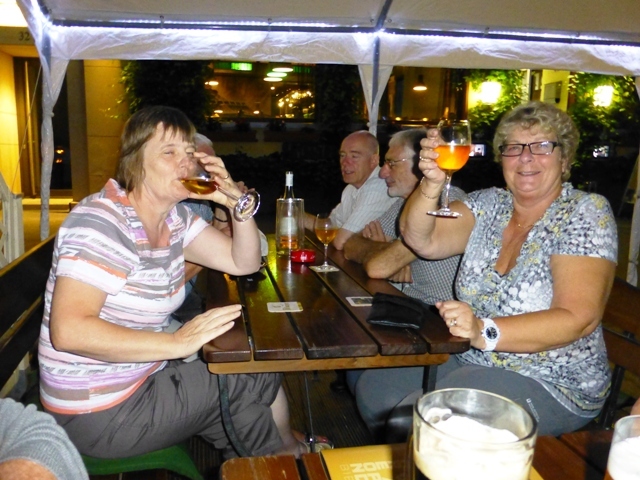 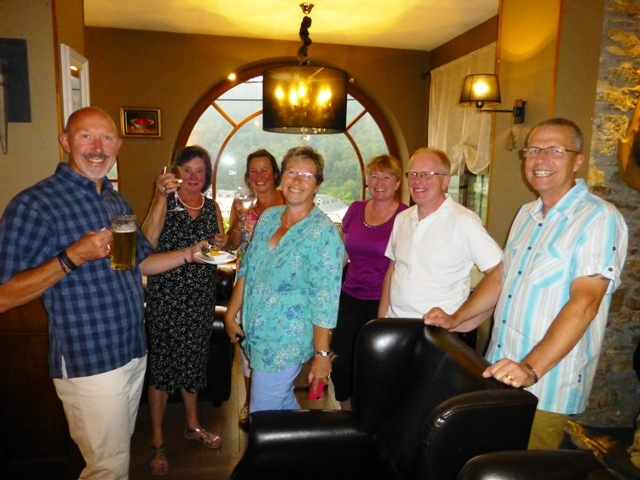 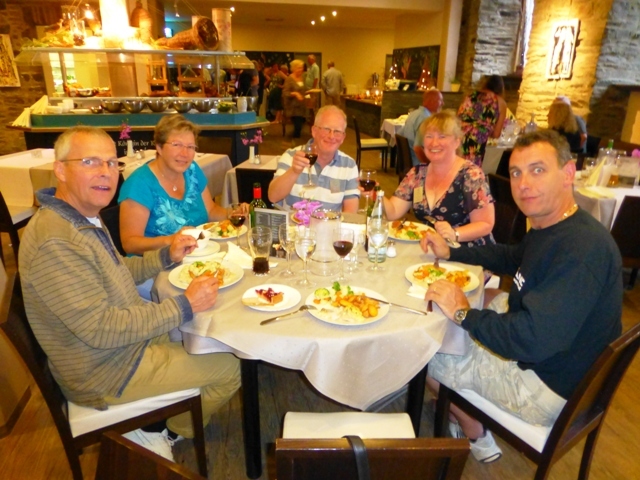 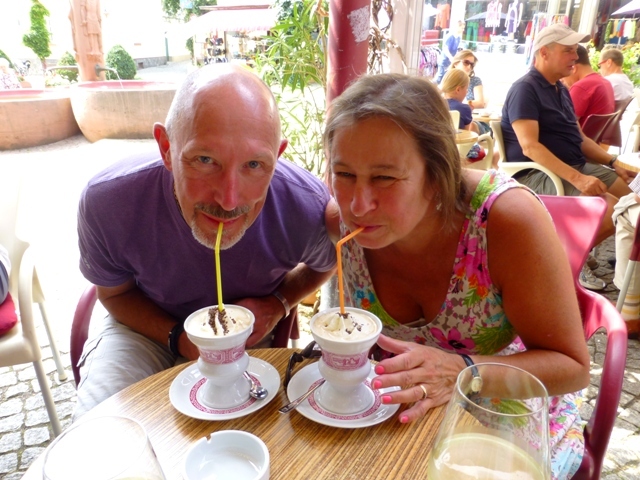 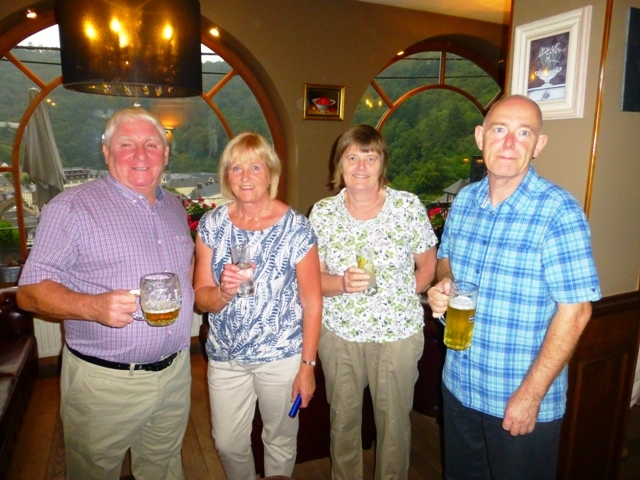 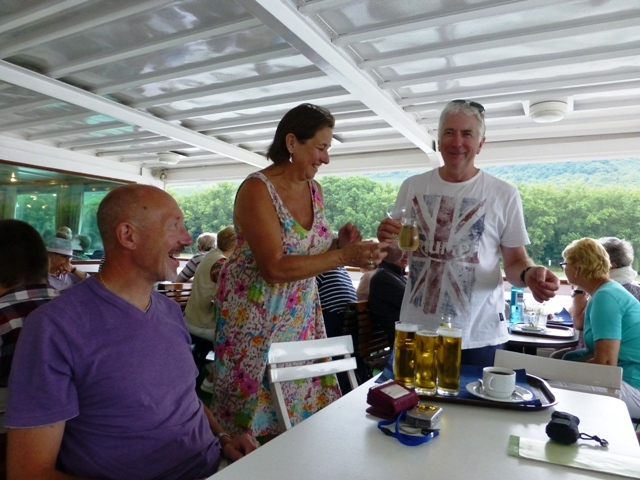 Lyn & Ted, Sue & Martin had champagne on the ski-lift; Tim tries to sample the local brew!! 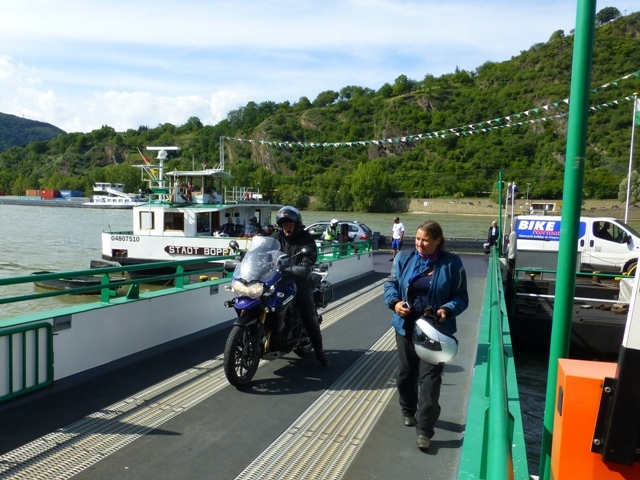 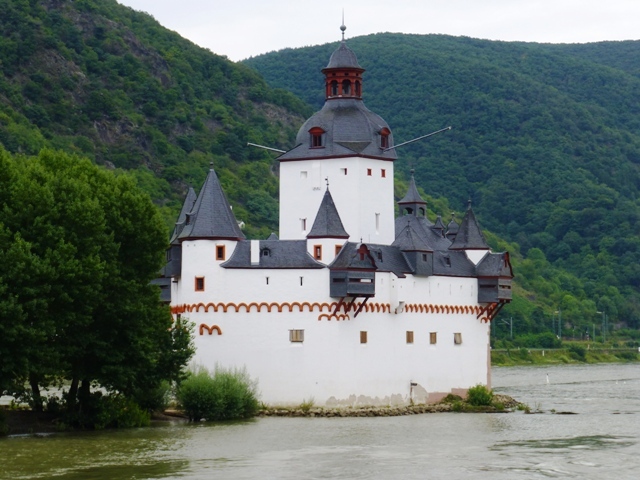 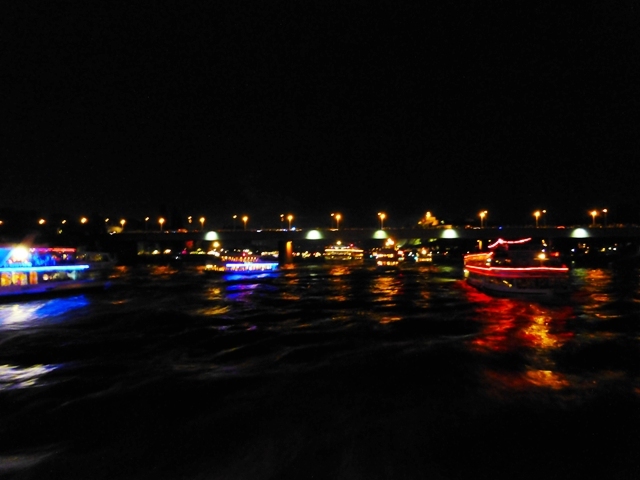 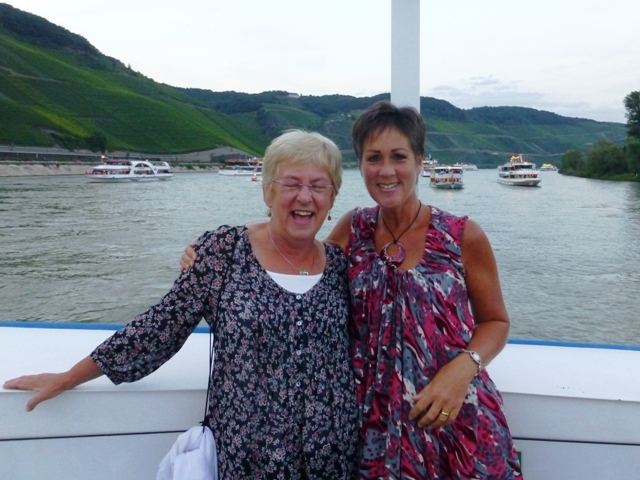 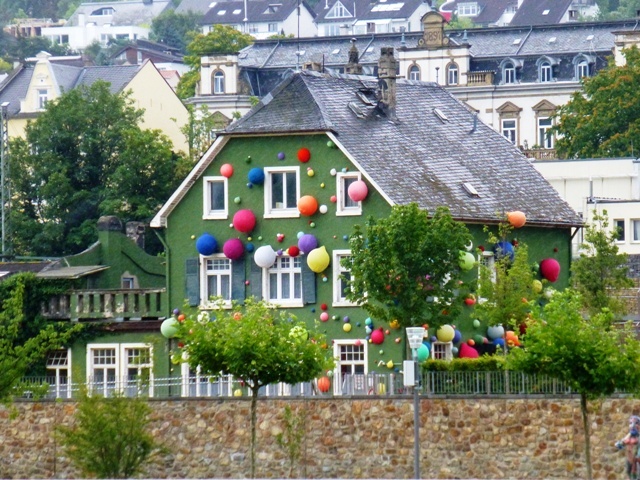 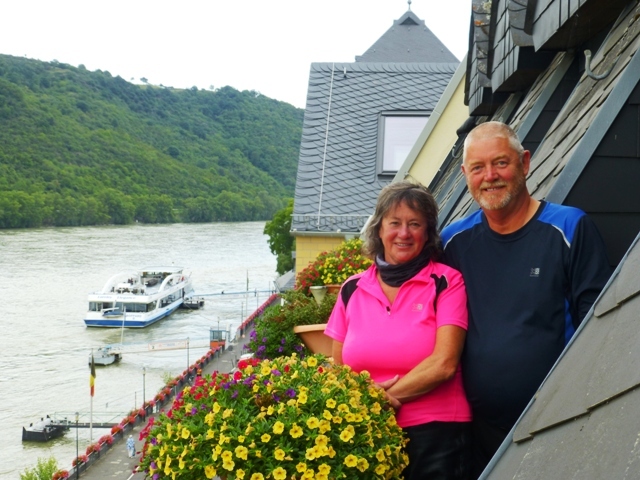 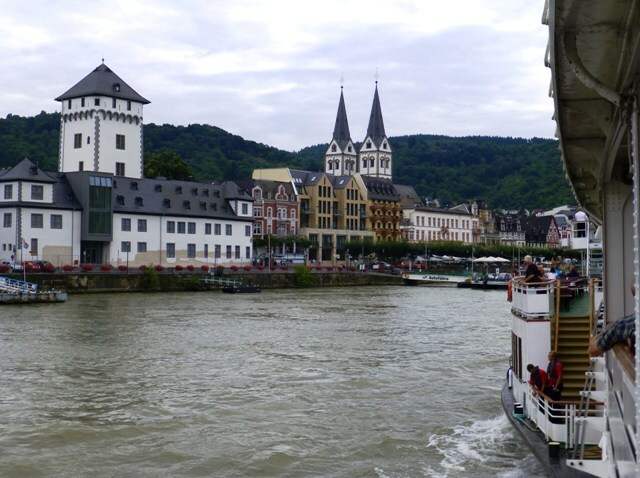 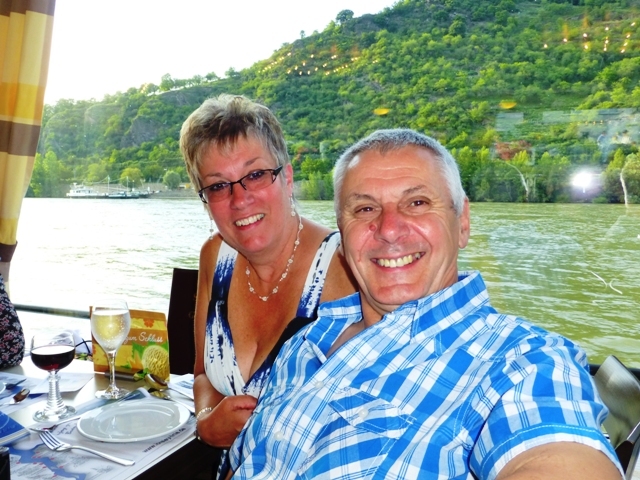 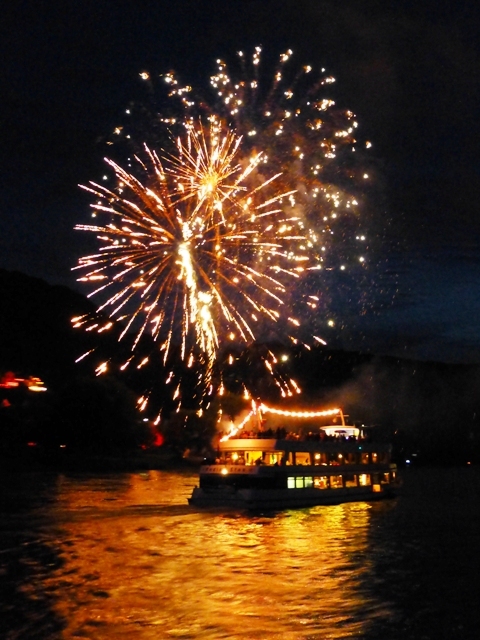 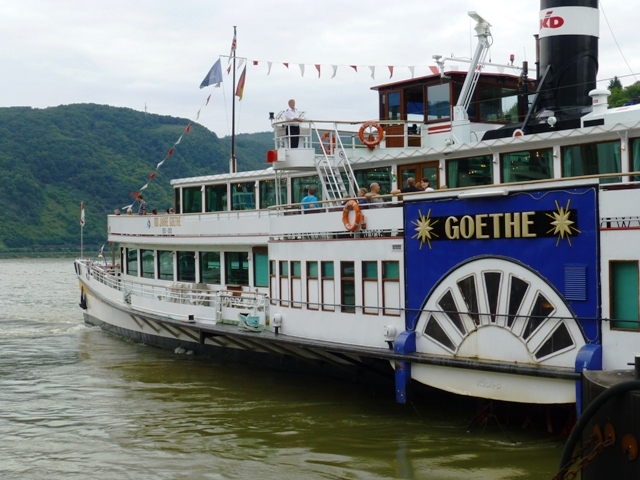 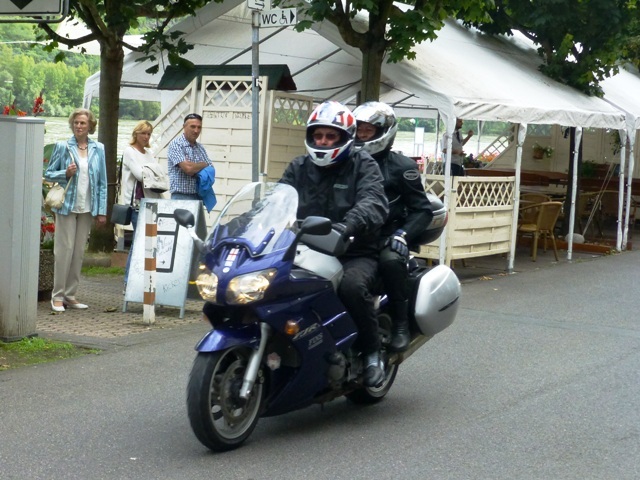 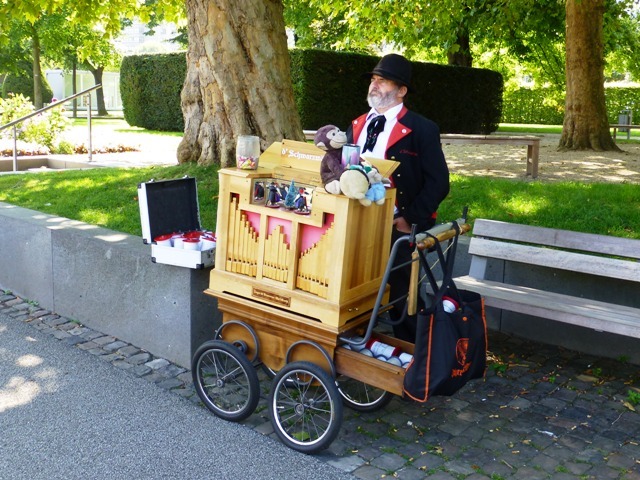 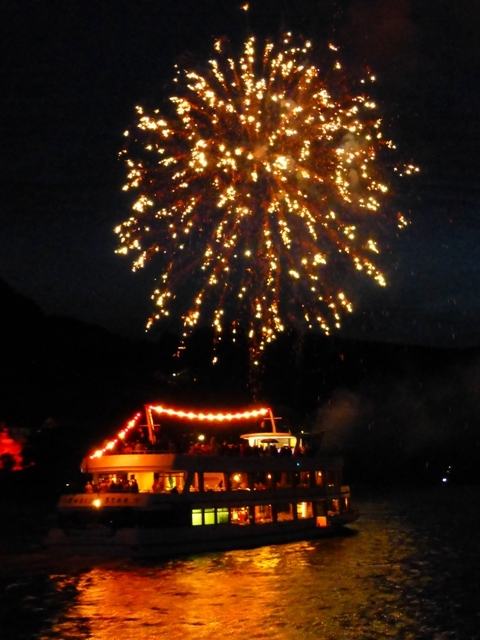 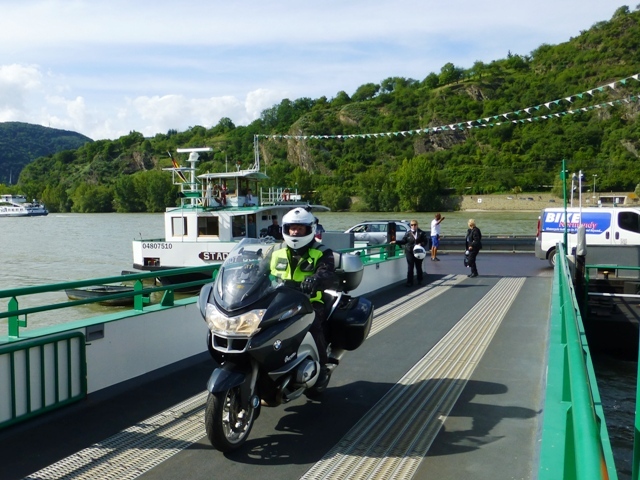 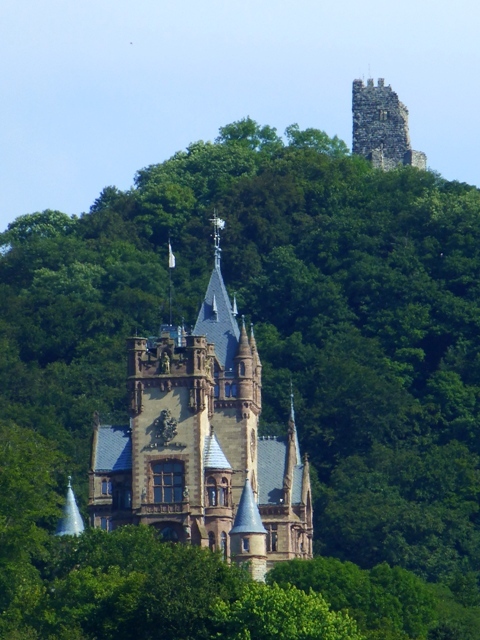 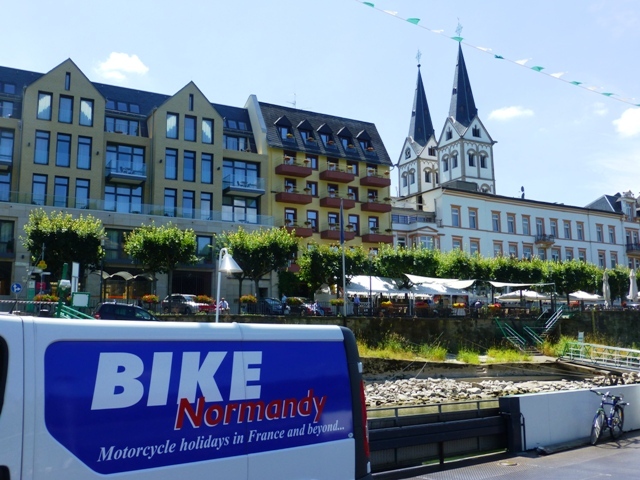 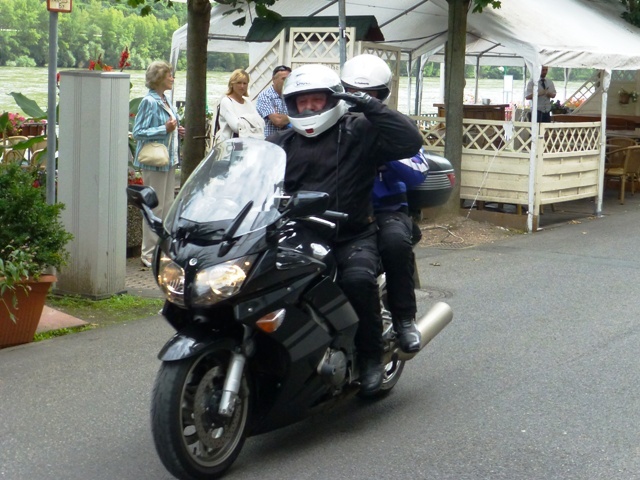 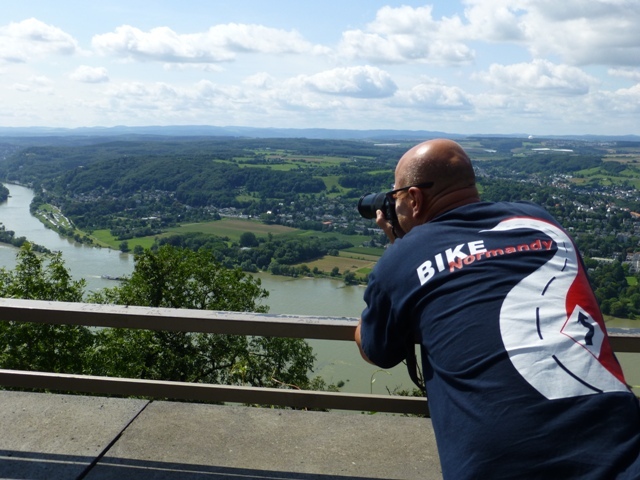 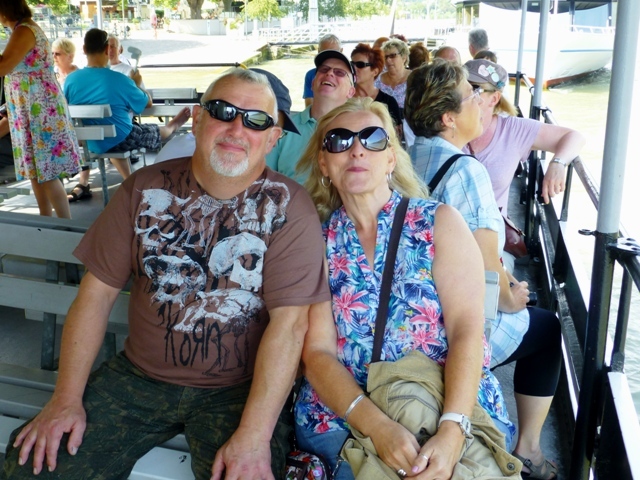 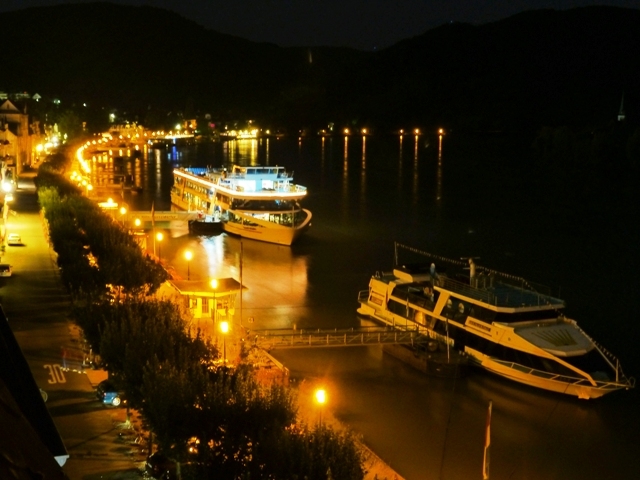 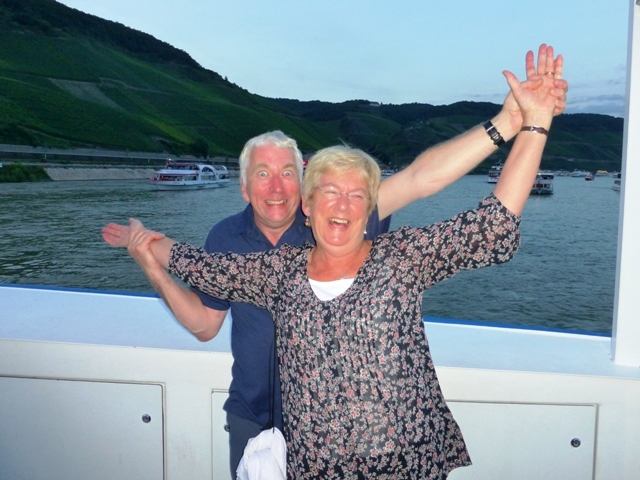 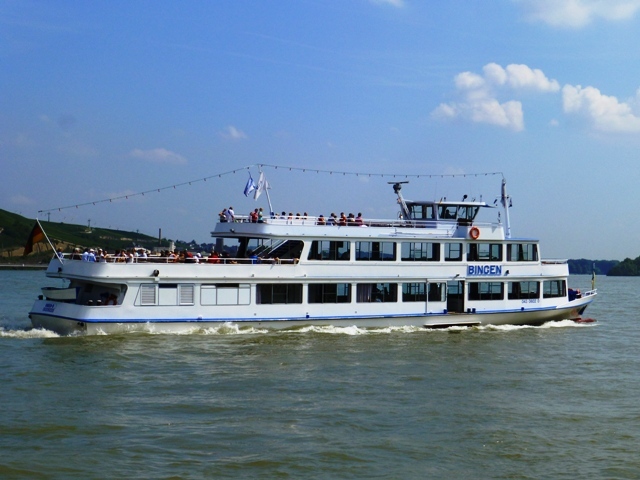 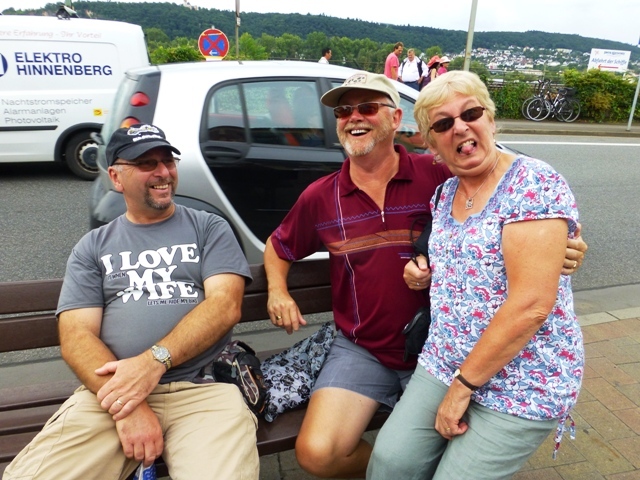 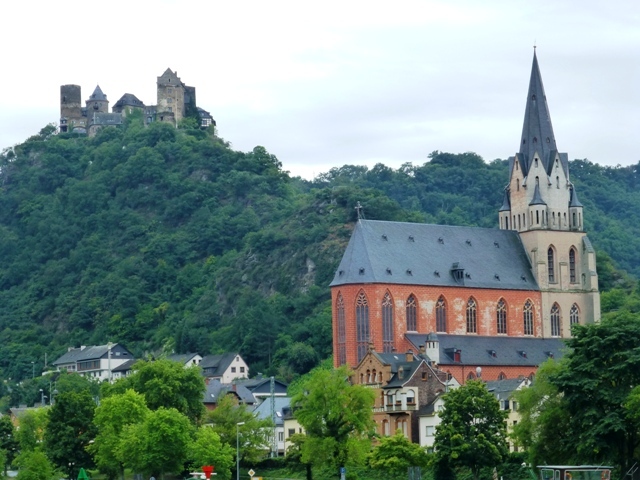 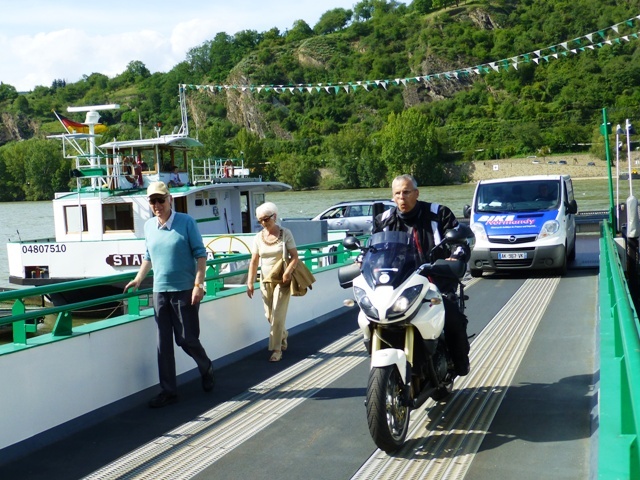 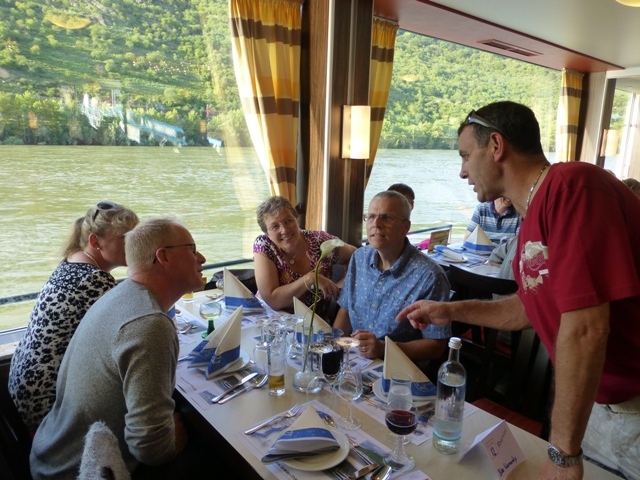 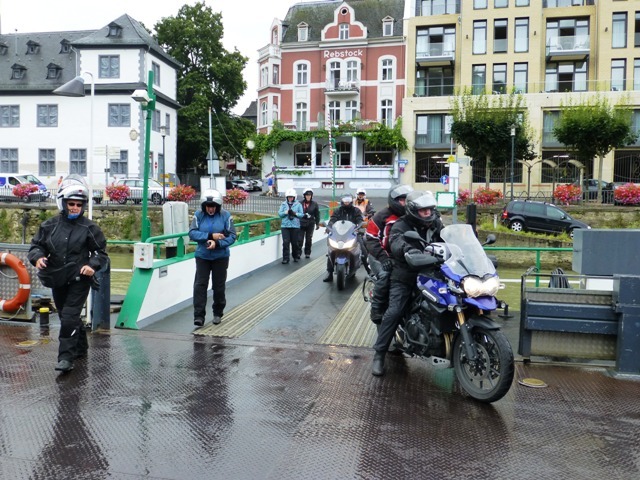 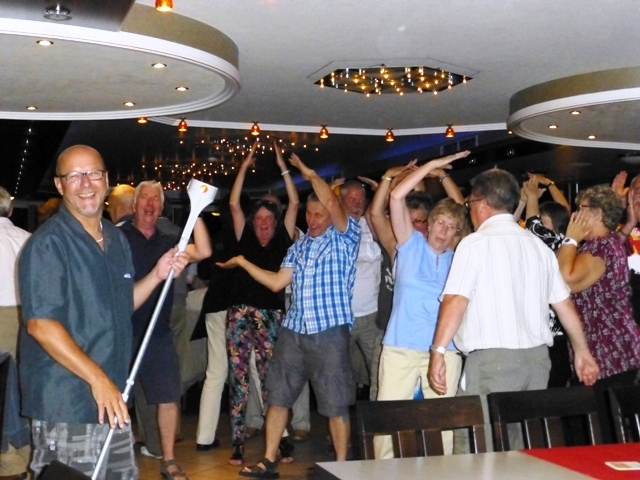 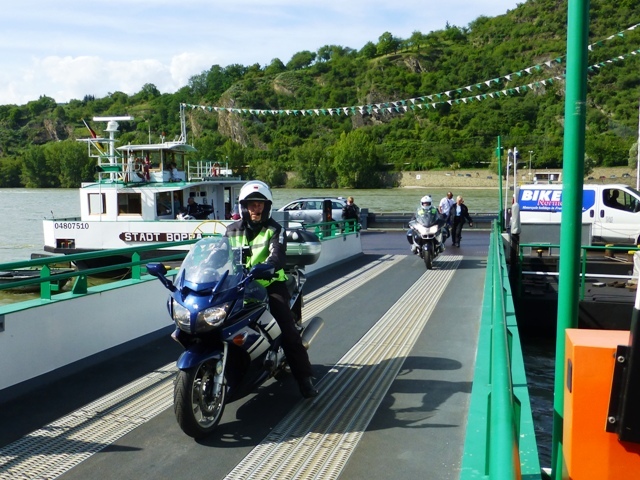 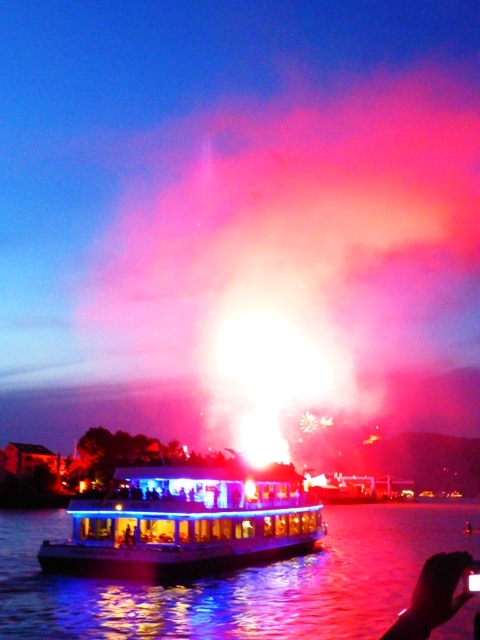 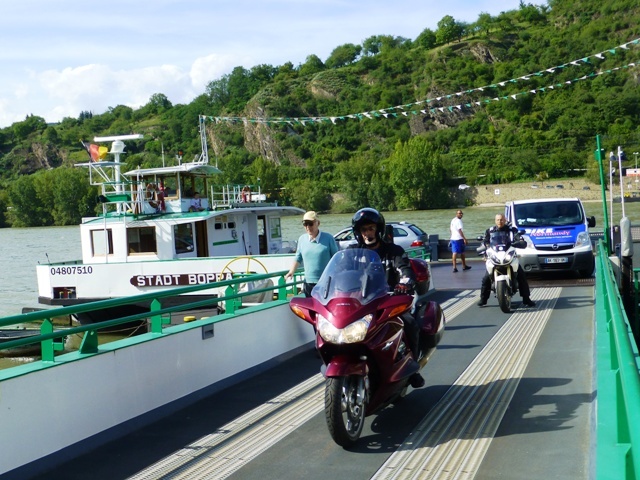 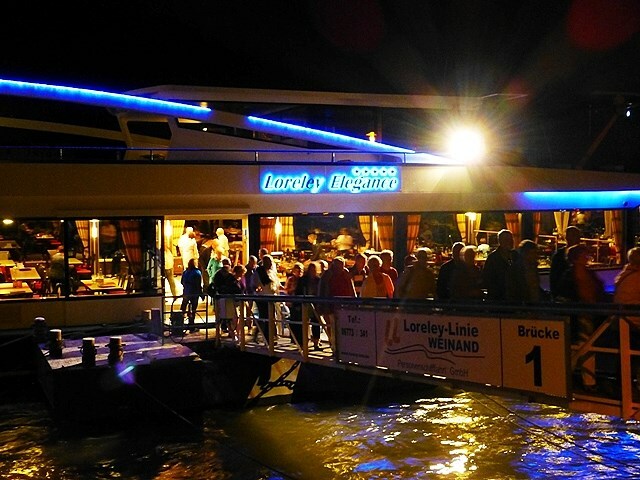 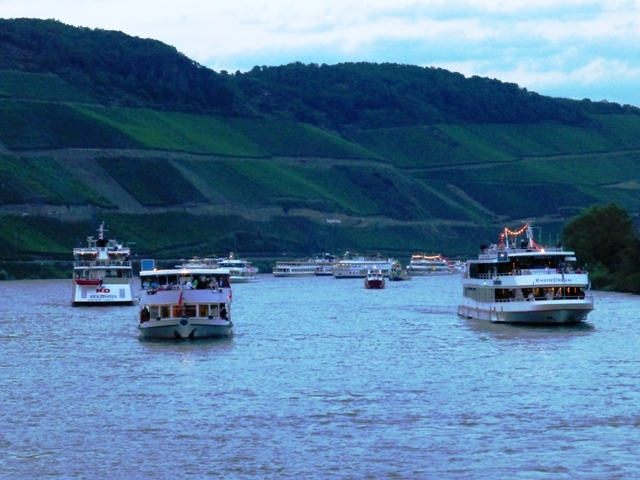 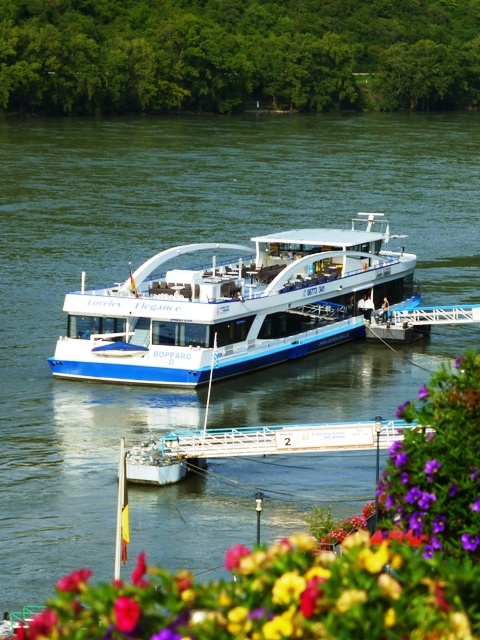 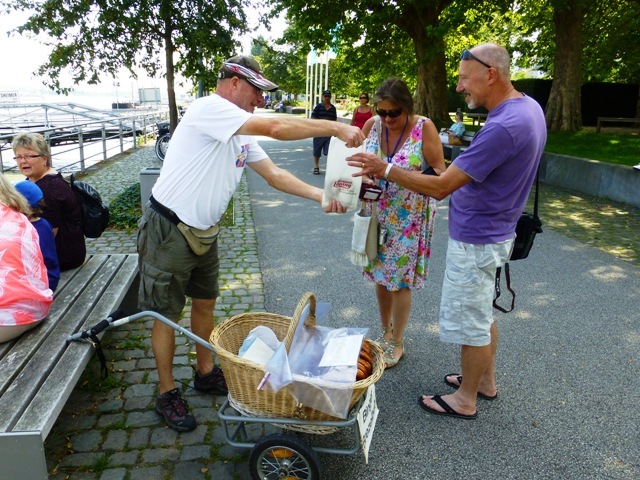 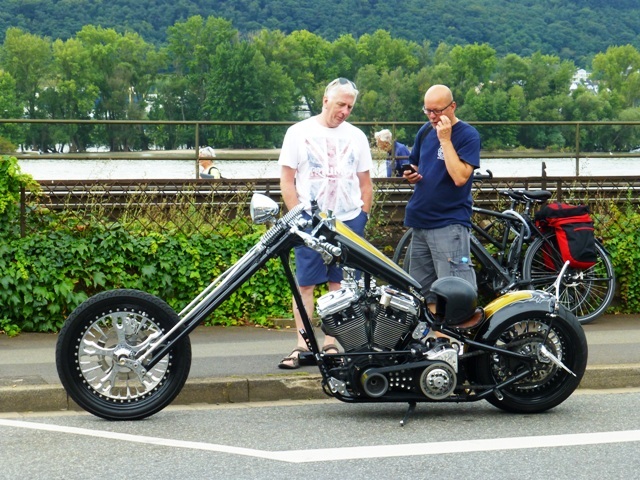 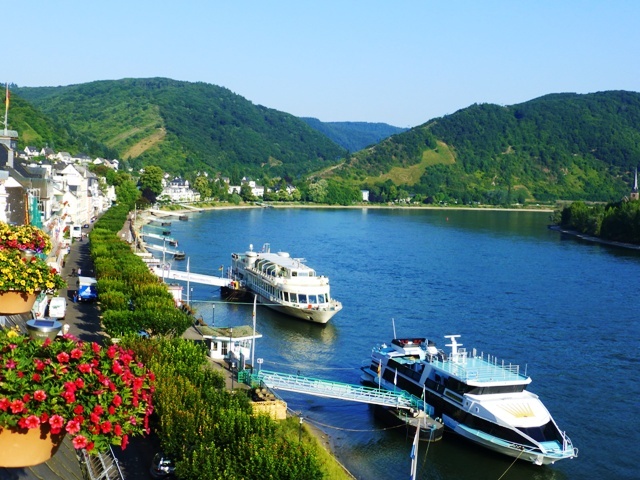 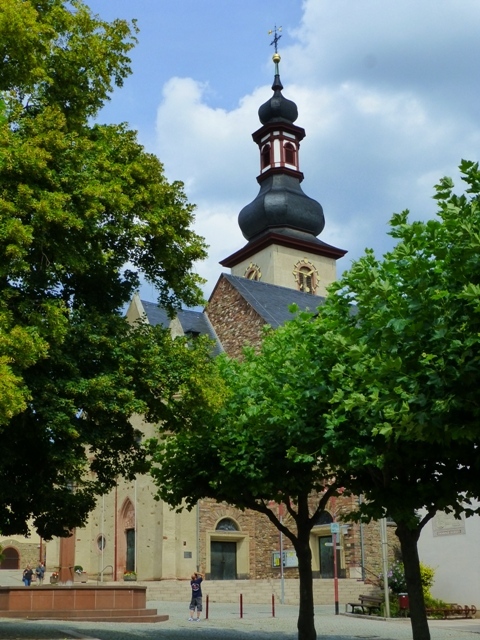 Some of us take the paddle boat back to Boppard – strange sights en-route! 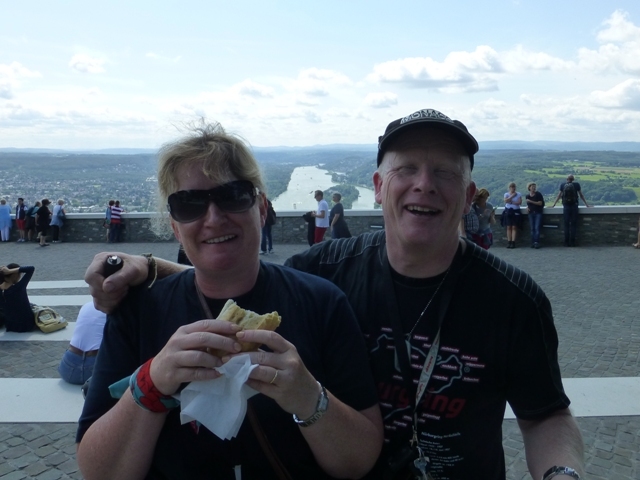 The most spectacular view awaits our return to Boppard! 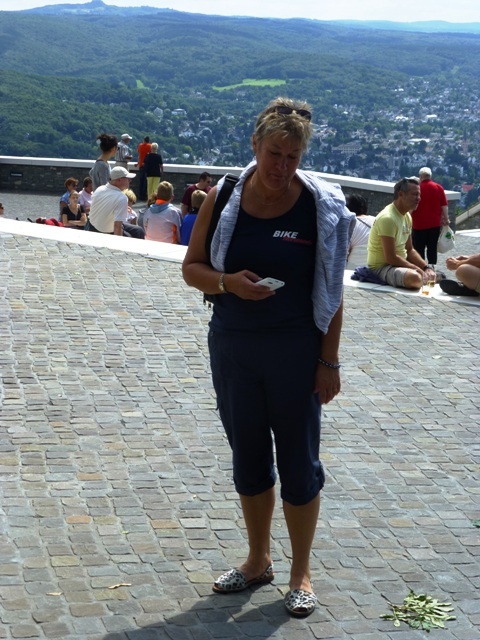 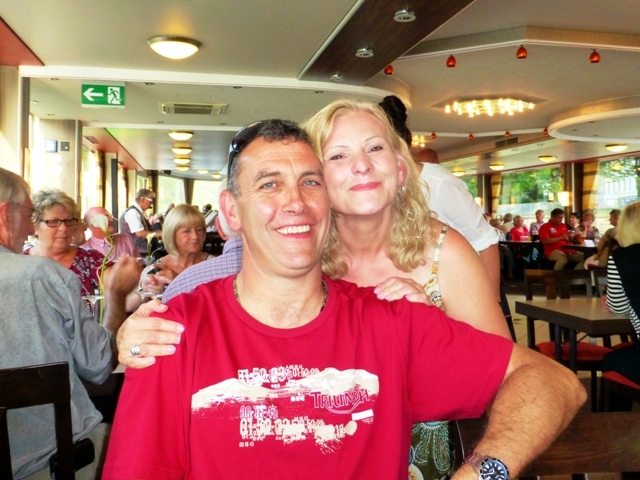 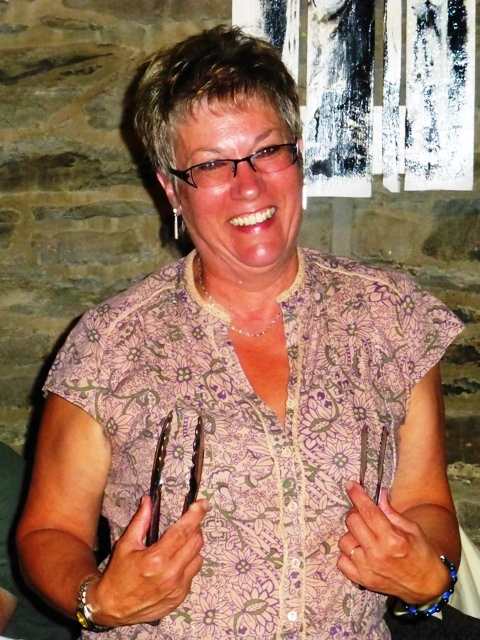 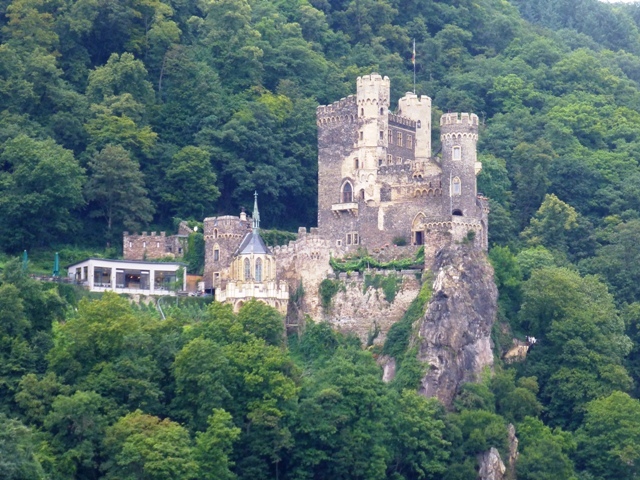 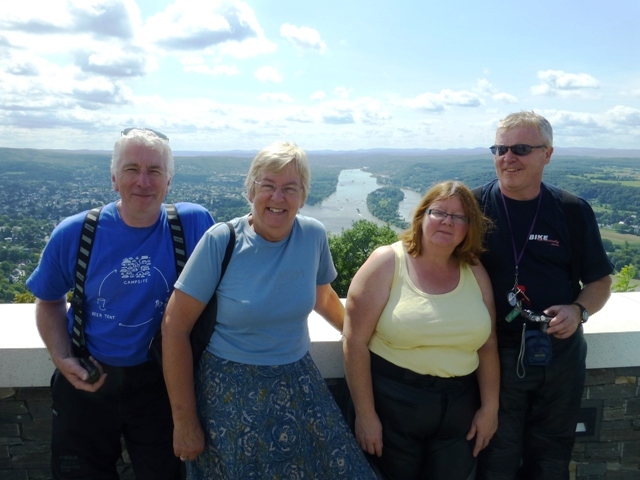 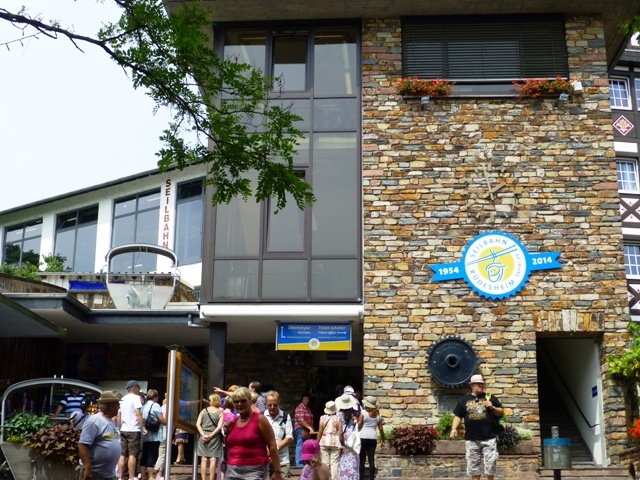 We take the funicular railway up to the Dragonfels ; Sharron & Kieron ; Allan – but where’s Jane ??? 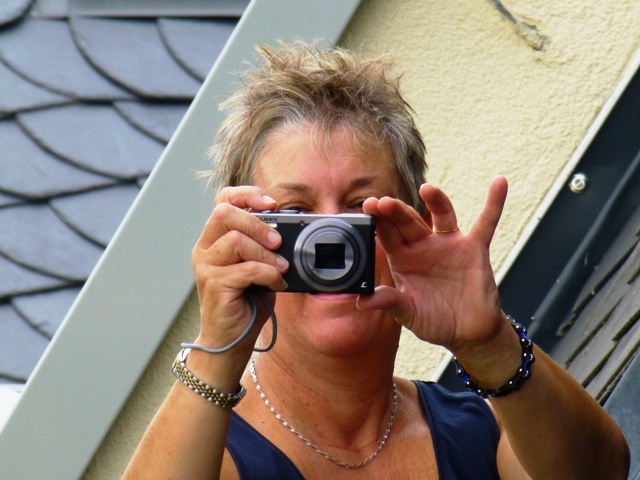 Here’s Jane! 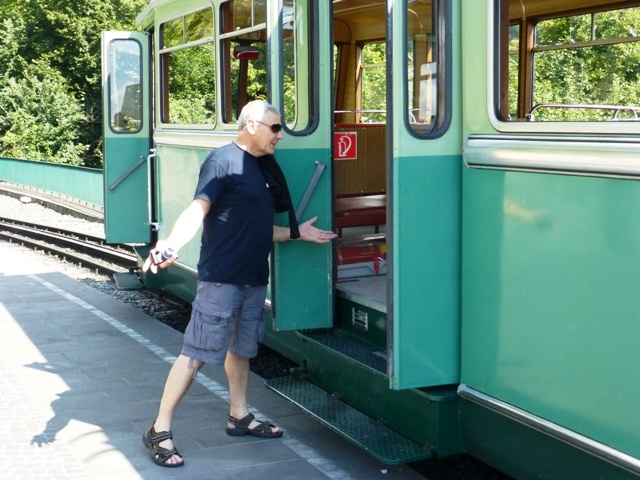 Having stepped off the train to allow a wedding party to dismount the driver closed the doors & left without her! 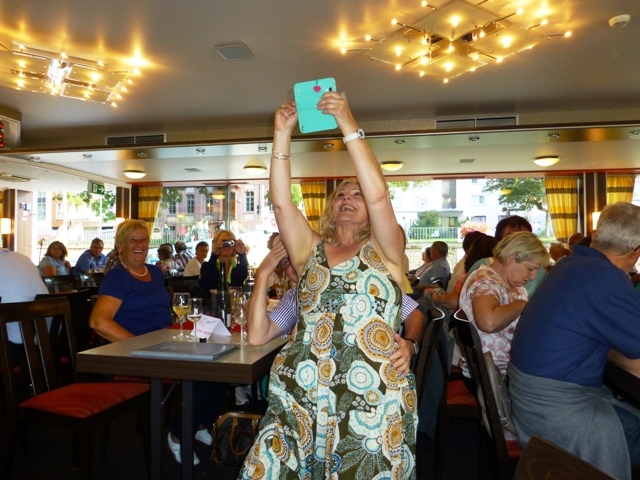 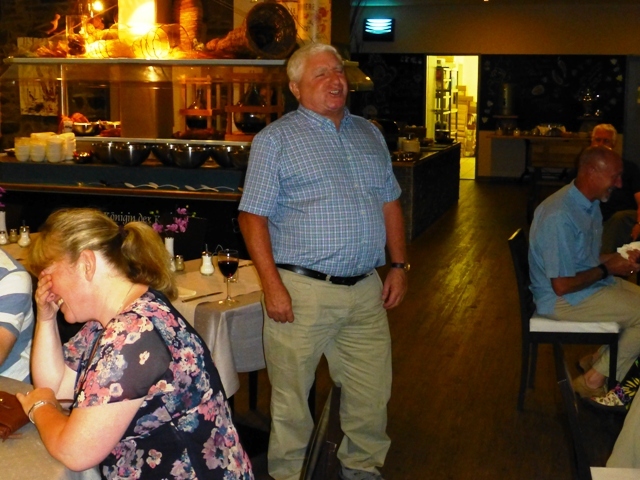 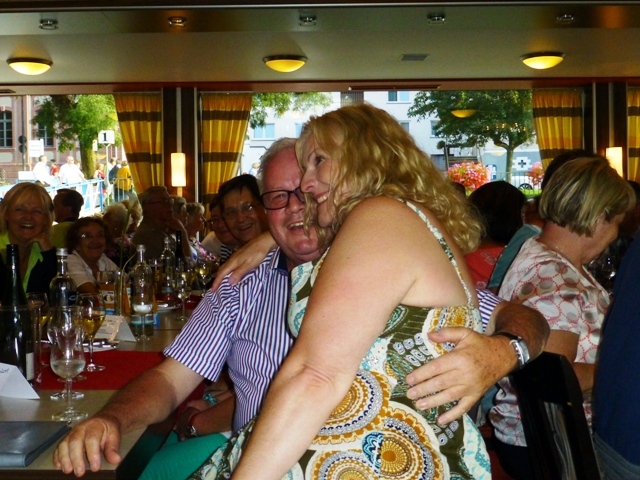 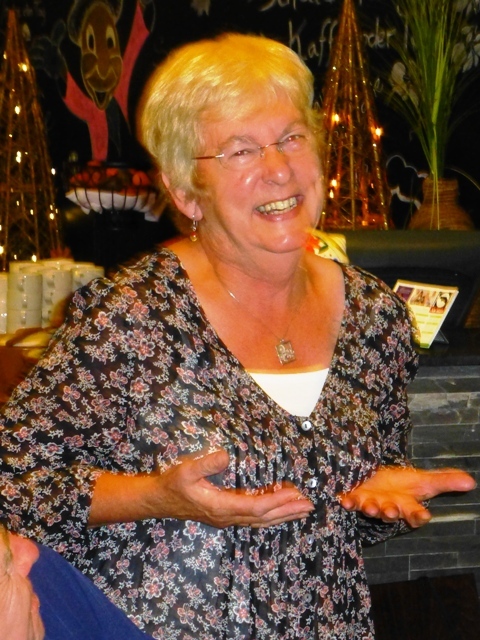 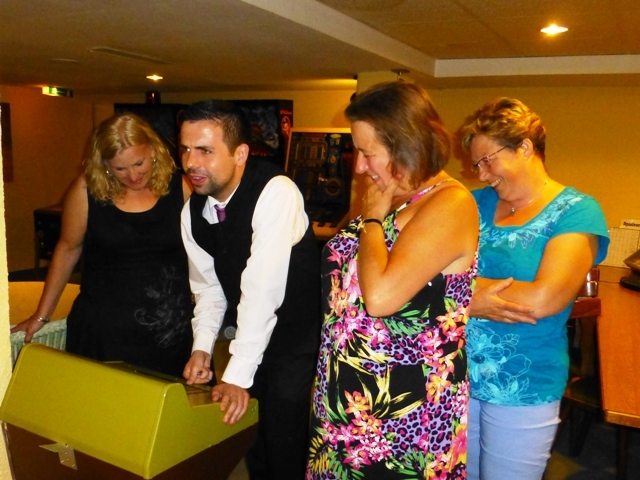 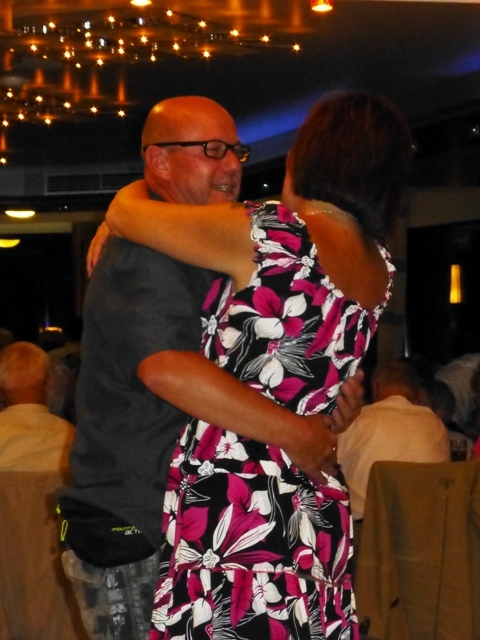 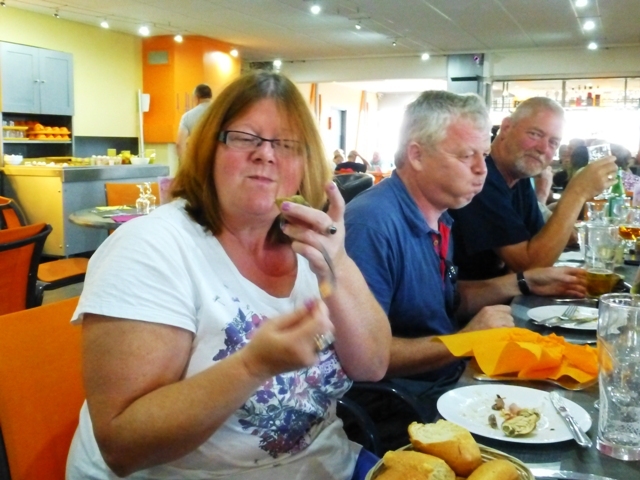 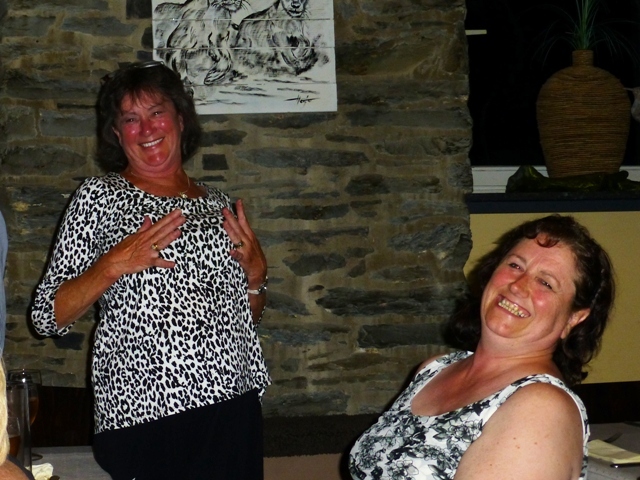 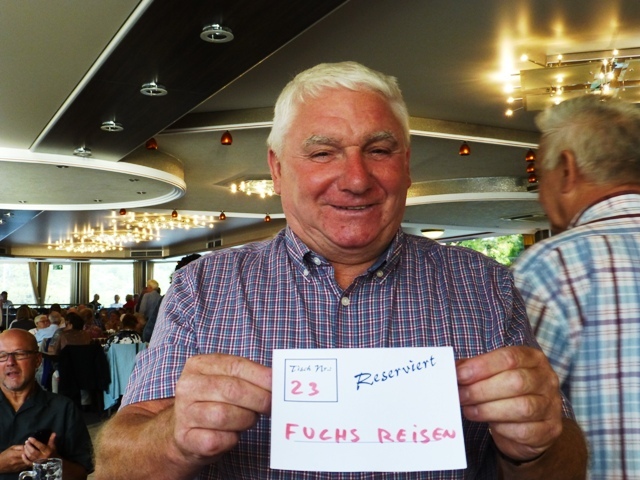 We’re all laughing as first Sharron & then Sue are encouraged to sit on a German guest’s knees to take their photos! 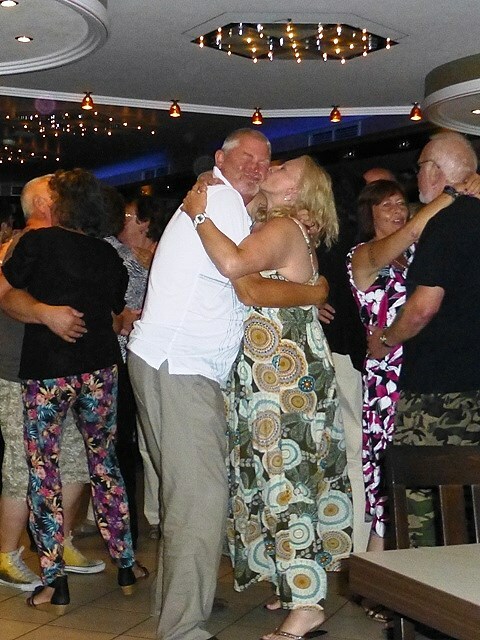 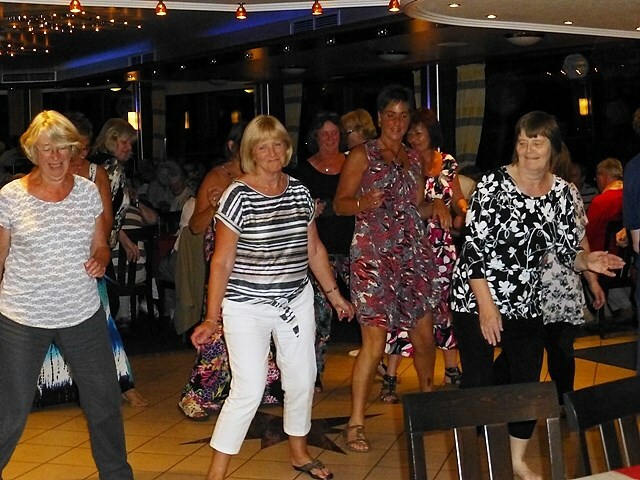 The girls take to the dance floor with the “Wigan Slosh” but goodness knows what Kieron & Barry are doing! 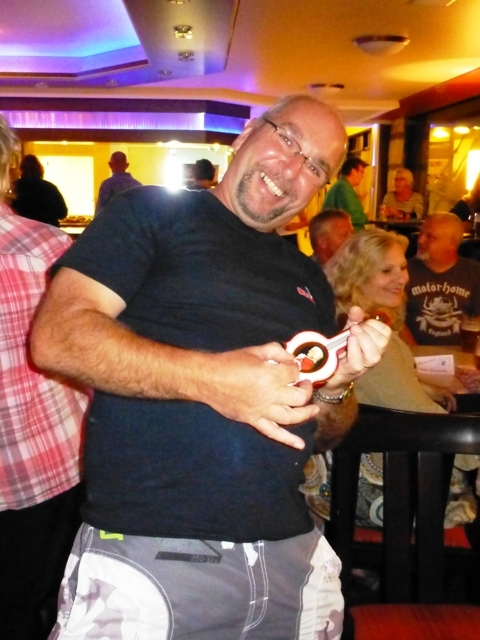 Barry plays guitar! 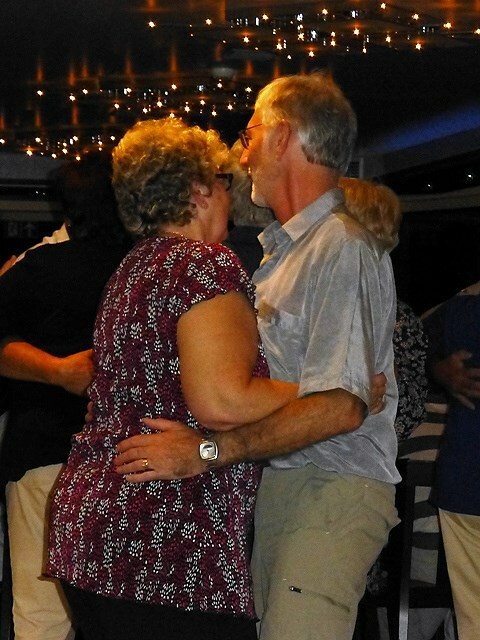 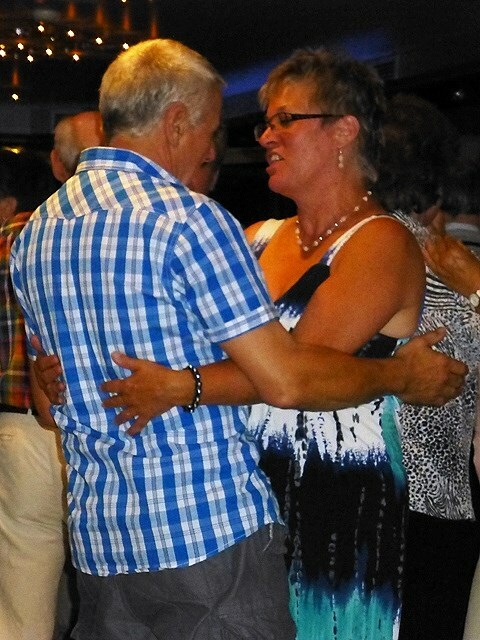 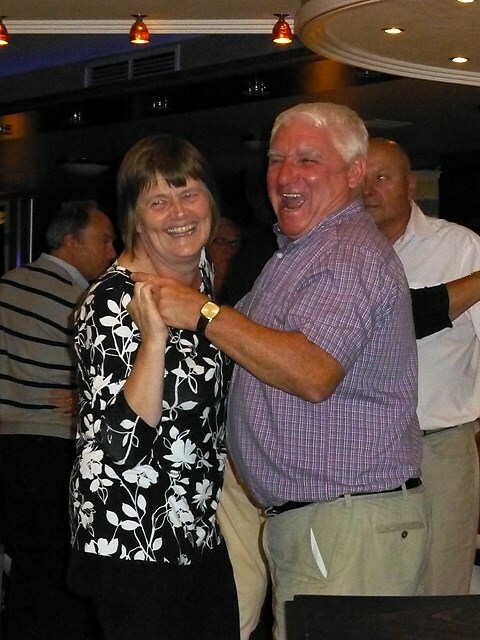 Jean drags Ron onto the dance floor! 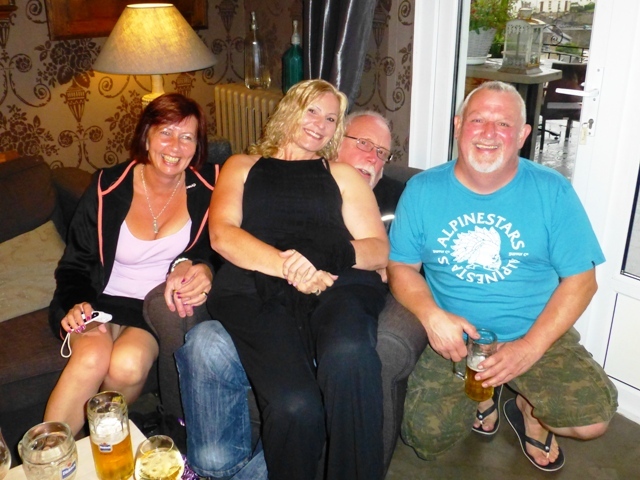 Rather a lot of wife swapping going on !! 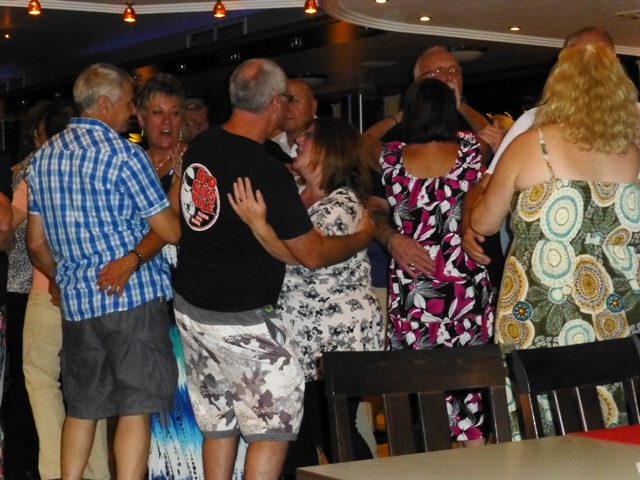 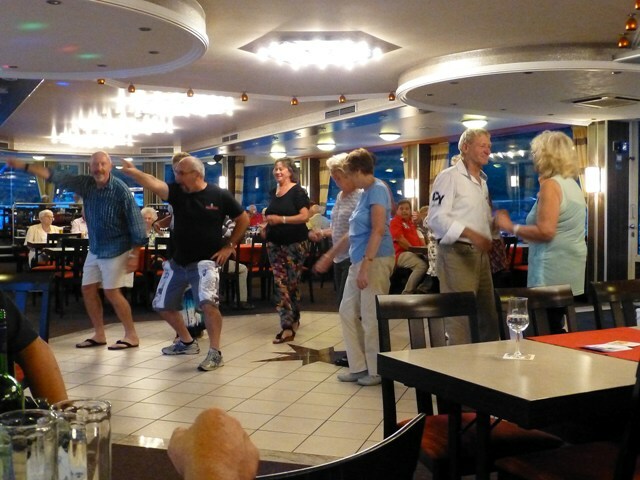 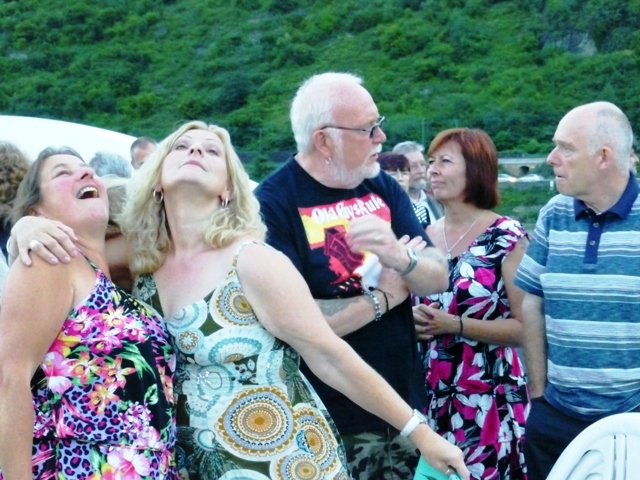 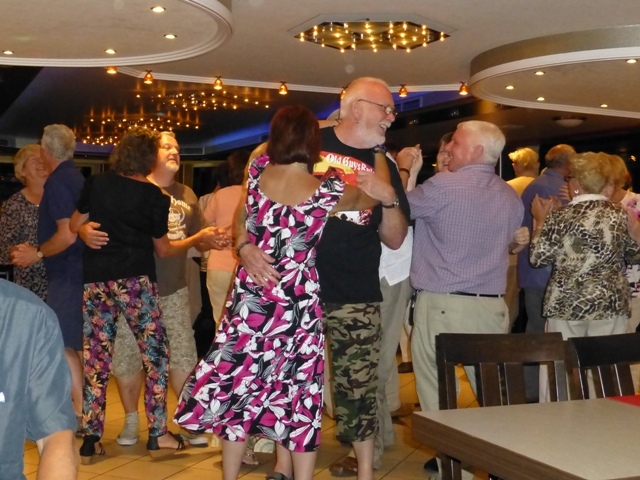 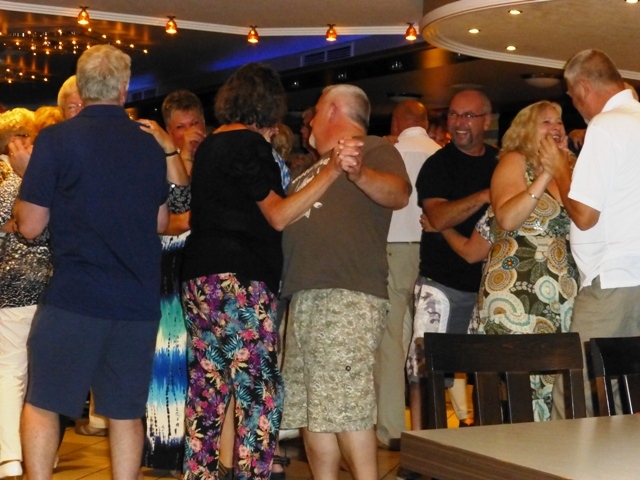 The “Wigan Slosh” again ! 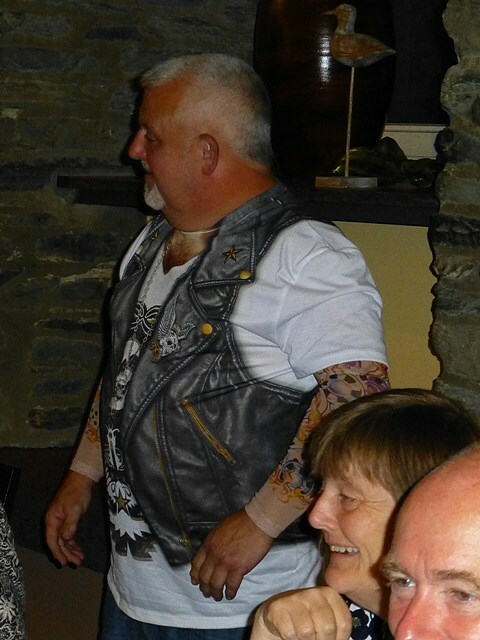 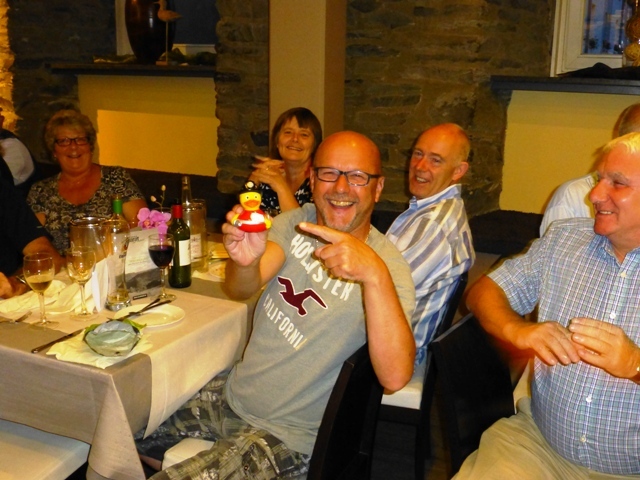 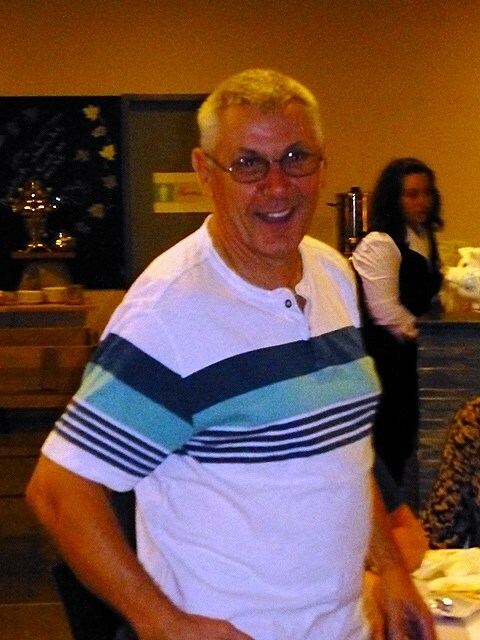 Tim – Mr Septic-member! 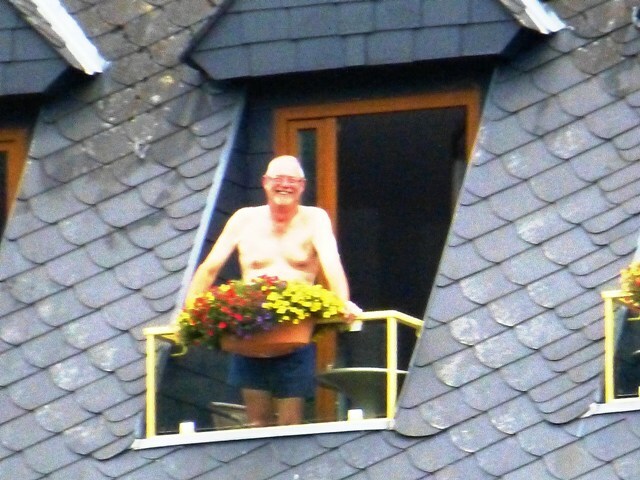 ; Barry – Mr Cocktober! 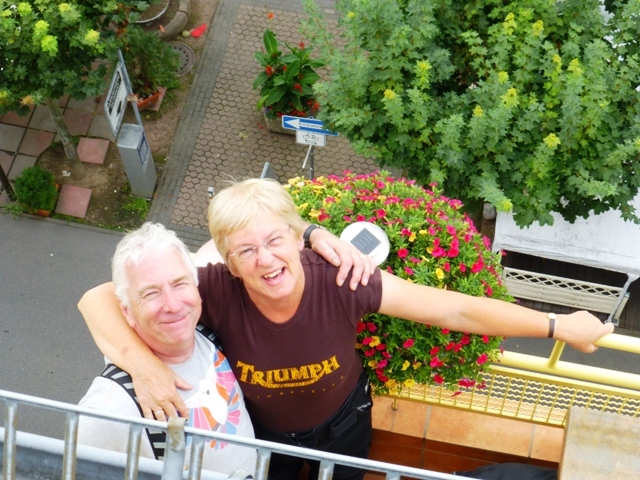 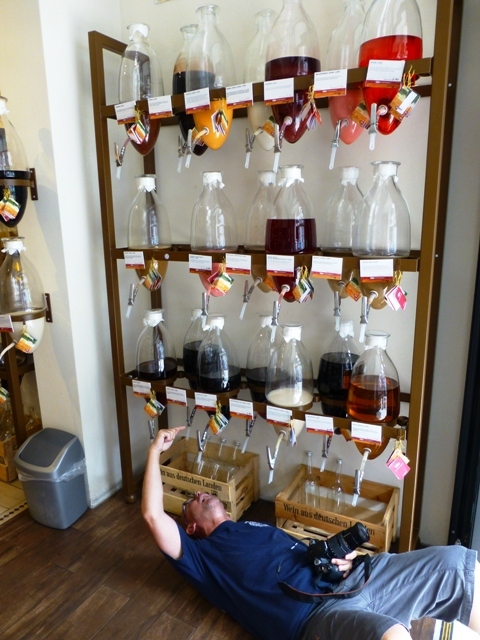 Ron recites that well-known Northern ditty – “Don’t fall off the roof, John”!!!!! 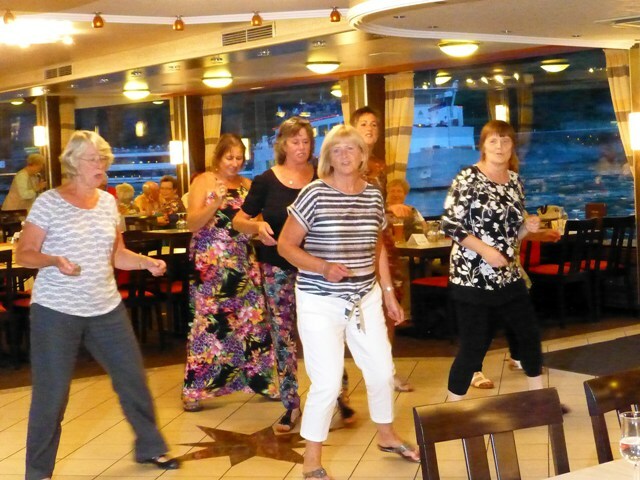 Sue takes a turn followed by Lyn – who’s taking this very seriously! 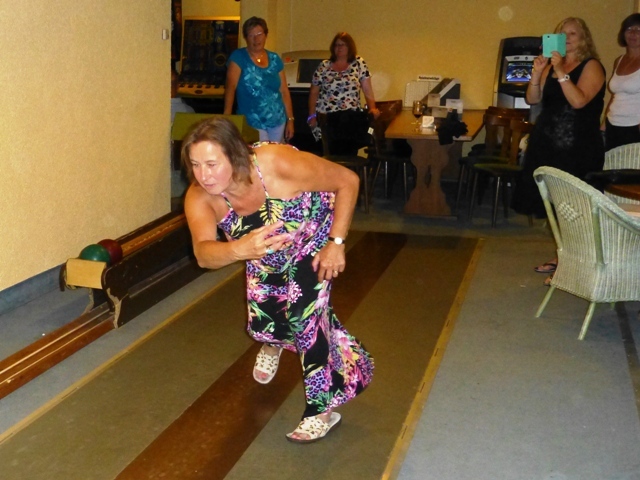 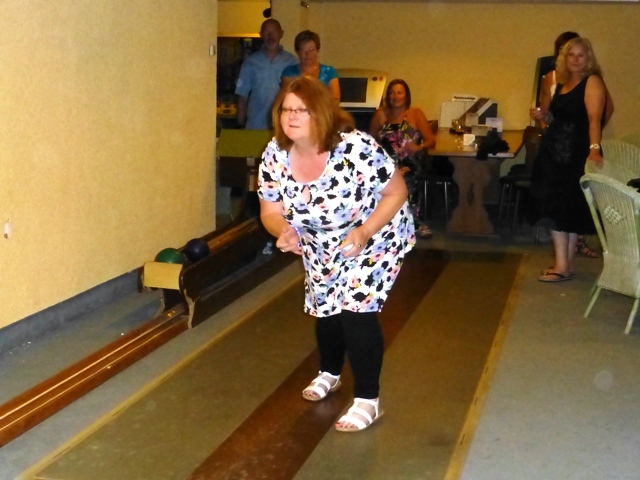 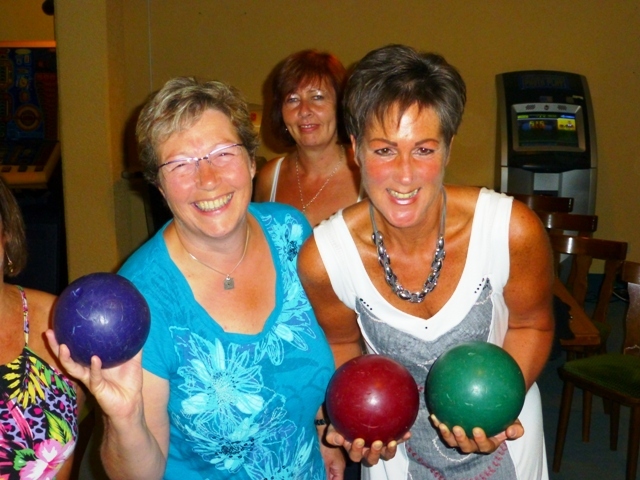 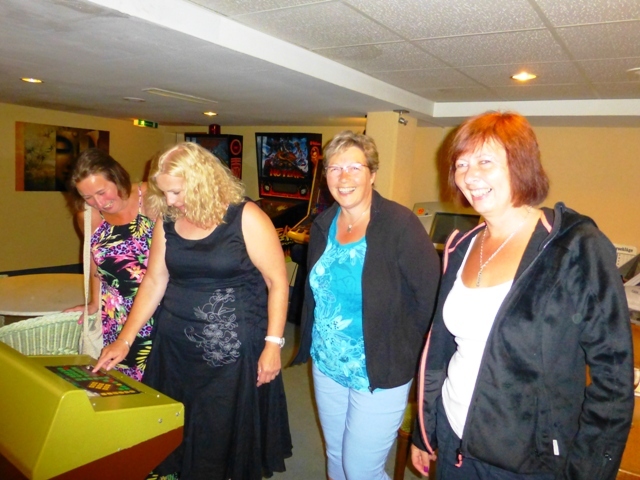 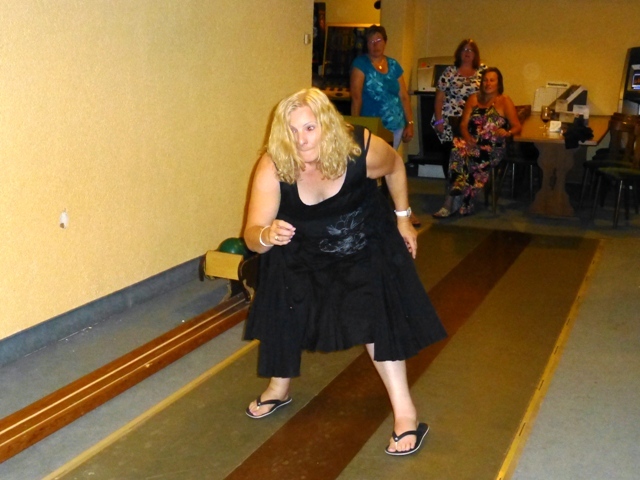 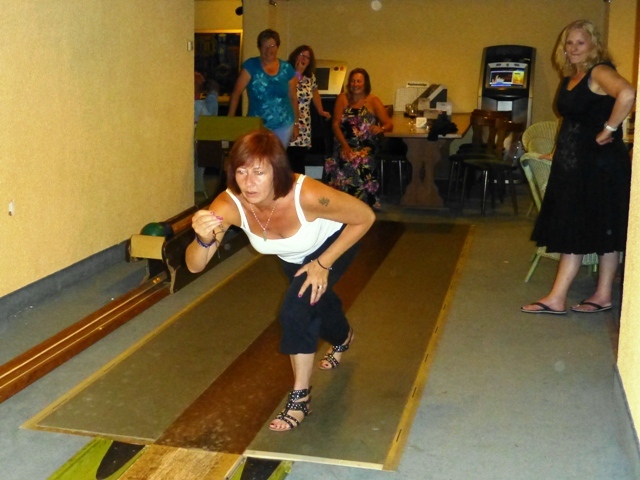 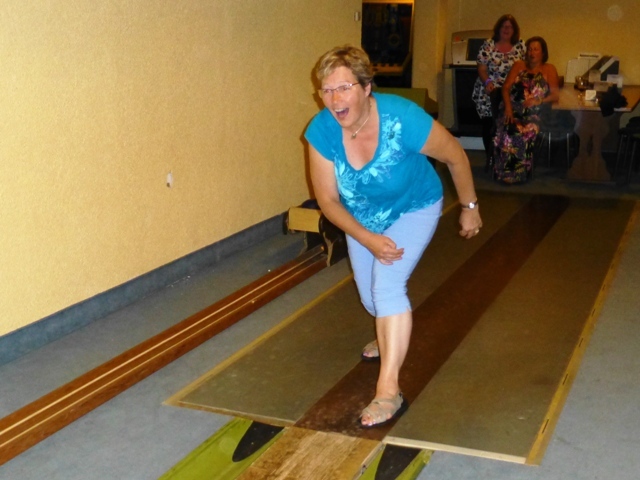 Sue & Jen try too hard & the balls run down the gulley! 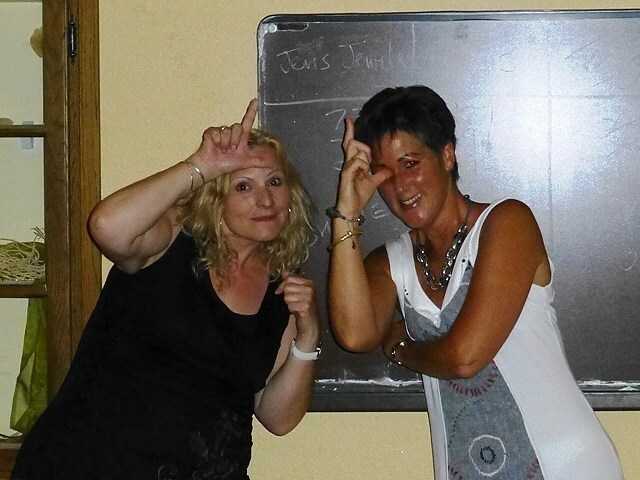 Losers!!!! 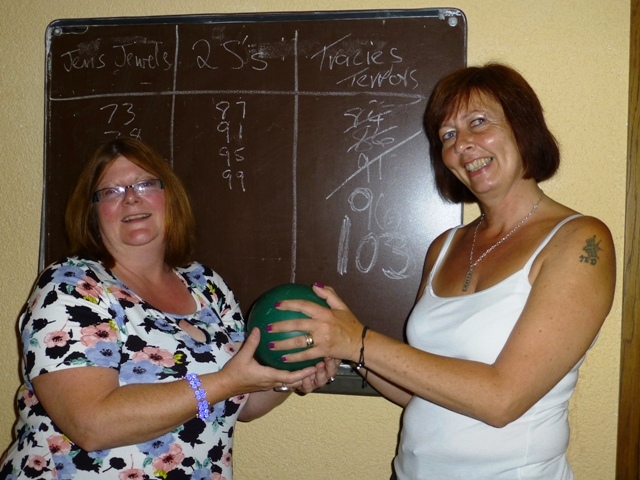 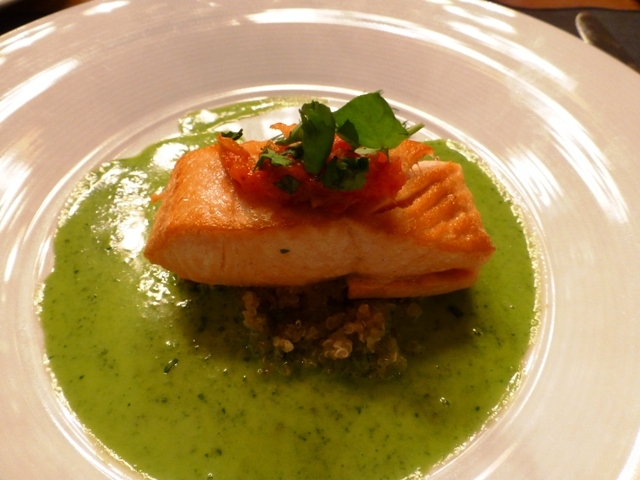 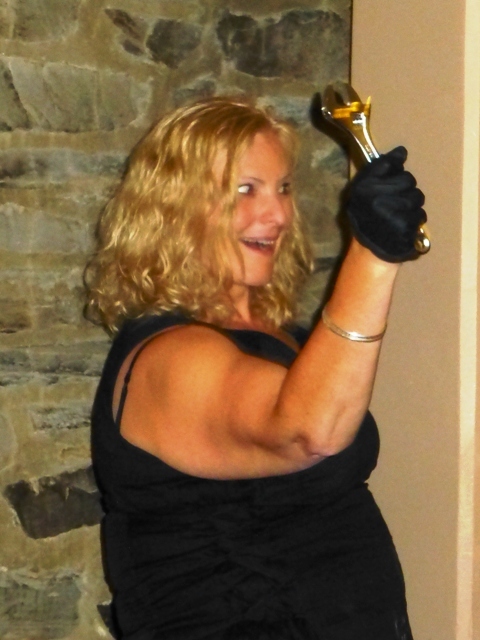 And the Winners are – Traci & Lyn !! 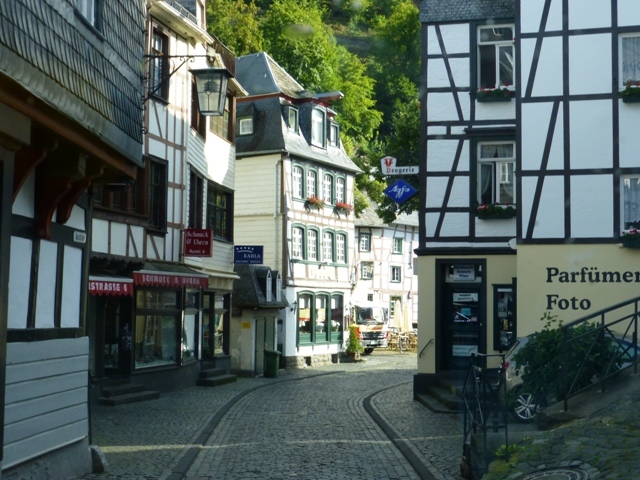 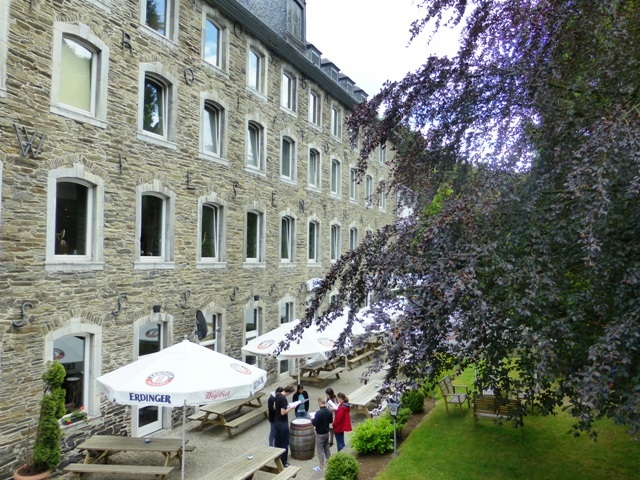 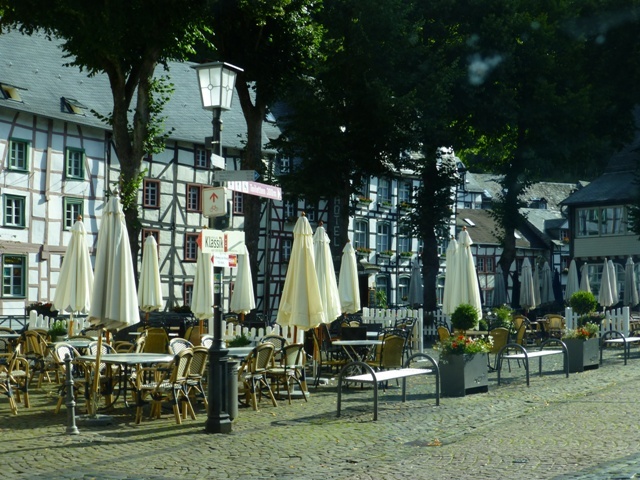 We leave pretty Monschau and head back to Calais.